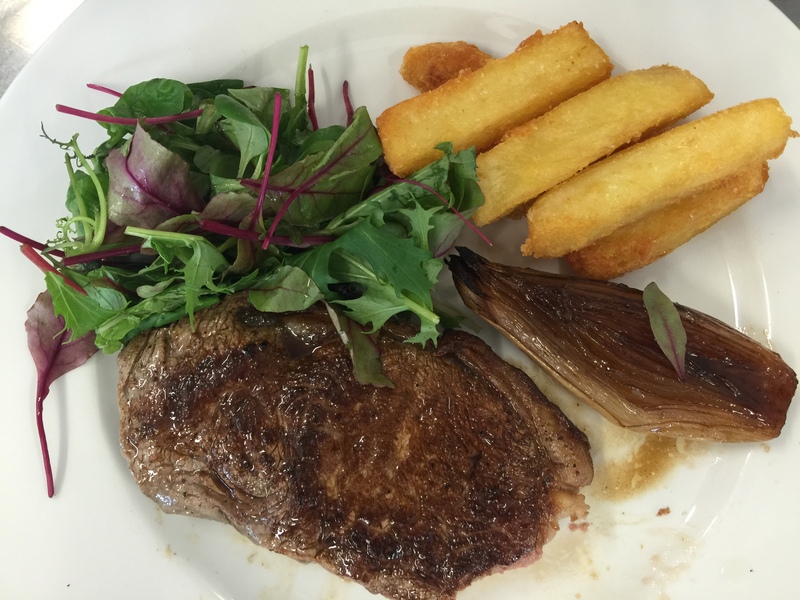 There’s nothing better than a decent steak and chips with a simple green salad. Done well, it can’t be beaten. No fancy sauce, no mustard just pure carnivorous pleasure on a plate. 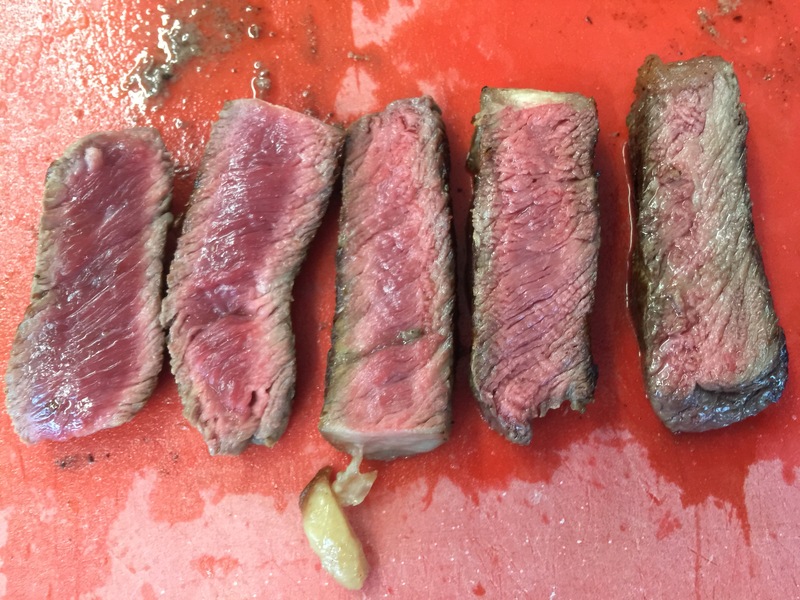 So, how do you cook the perfect steak? Good question. I think the secret for me, is in the cut of meat and where you buy it. Short-ageing, wet-ageing and what the animal is fed, how it’s killed and bad butchery will make a huge difference to what you serve. 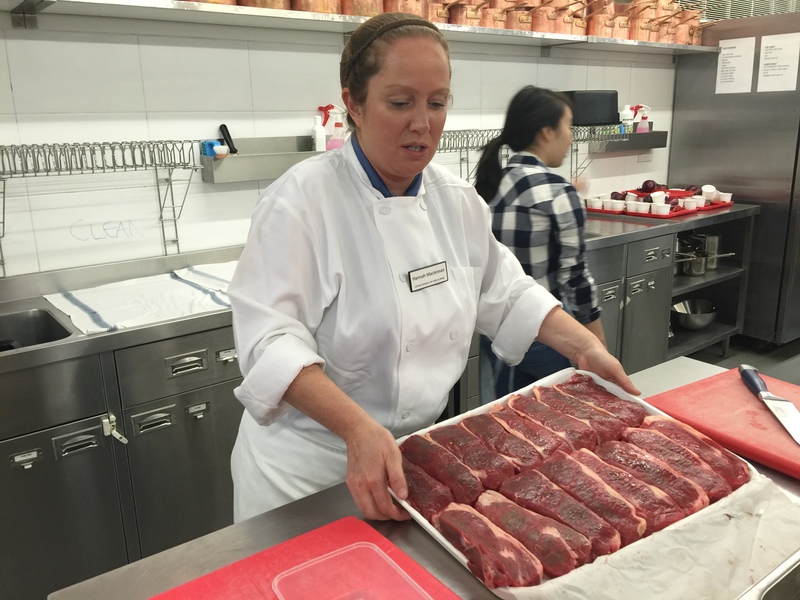 Poor treatment of the meat will result in poor tasting beef so it’s always good to get your steak from a butcher. Don’t be afraid. Butchers don’t bite and they like questions. 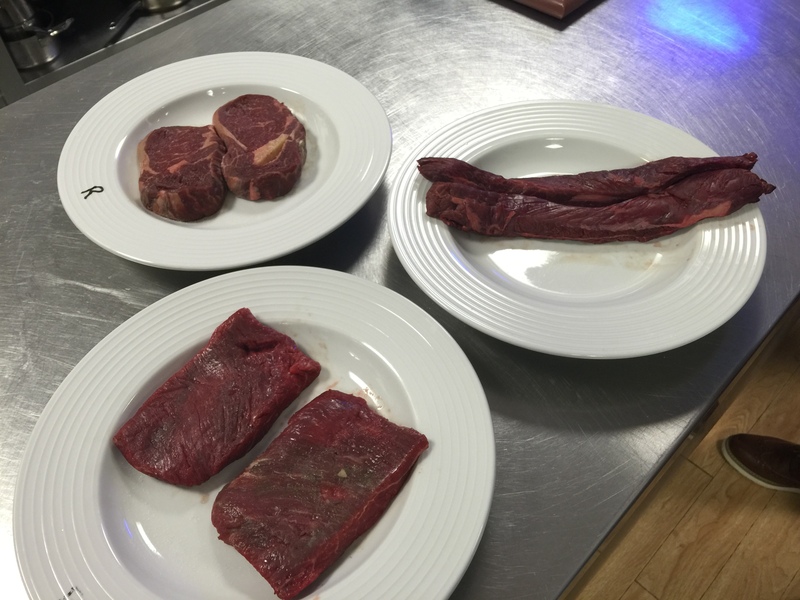 When I eat a steak at a restaurant, I waver between a fillet, a rib-eye and a sirloin, depending on where I am. Some of the best steak I’ve eaten has been in New York. Fillet steak which oozed off the plate in Tribeca Grill, sirloin enough for three in Smith and Wollensky on Third, then there’s Argentinian steak eaten in Argentina, memorably from Frances Mallmann’s restaurant 1884. A little closer to home I had a fabulous Tomohawk at the Blue Boar Grill I remember a time in the capital when Aberdeen Angus was THE place to go to eat steak. Now, there are so many choices it’s hard to get through them all. 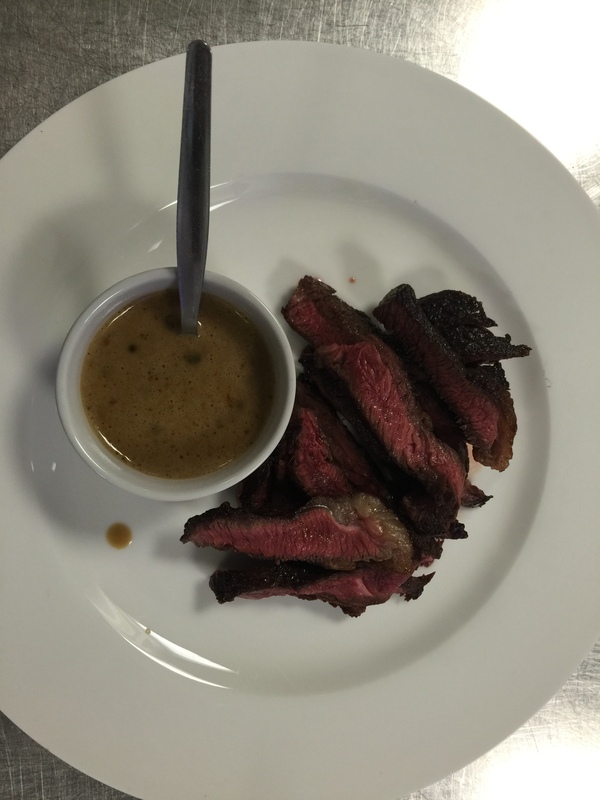 Hawksmoor, Gaucho, New Street Grill, Grillshack …. the list is endless. 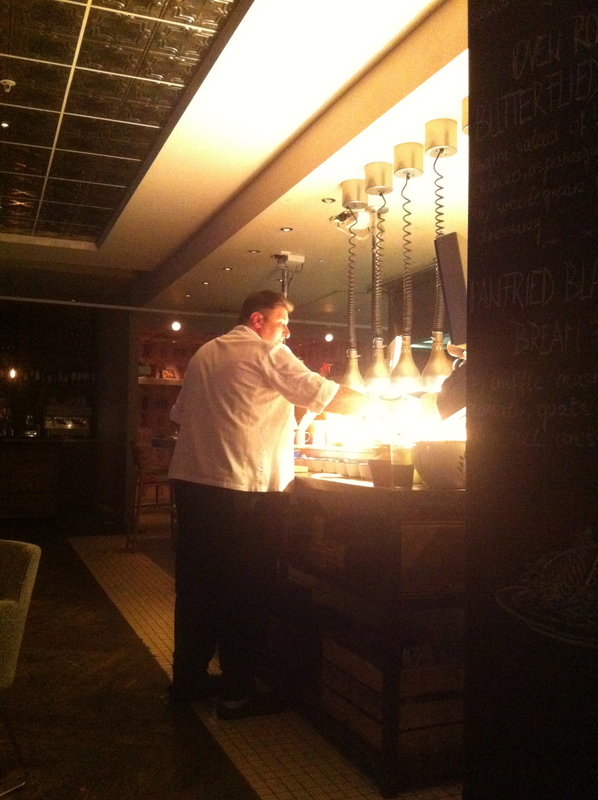 Most large-scale steak restaurants use a Josper Grill (pronounced hosper) which is essentially a charcoal oven, stoked by firewood, which uses the functions a traditional oven and grill would. It cooks at nuclear temperature, sealing the meat, smoking it and grilling it all at the same time. 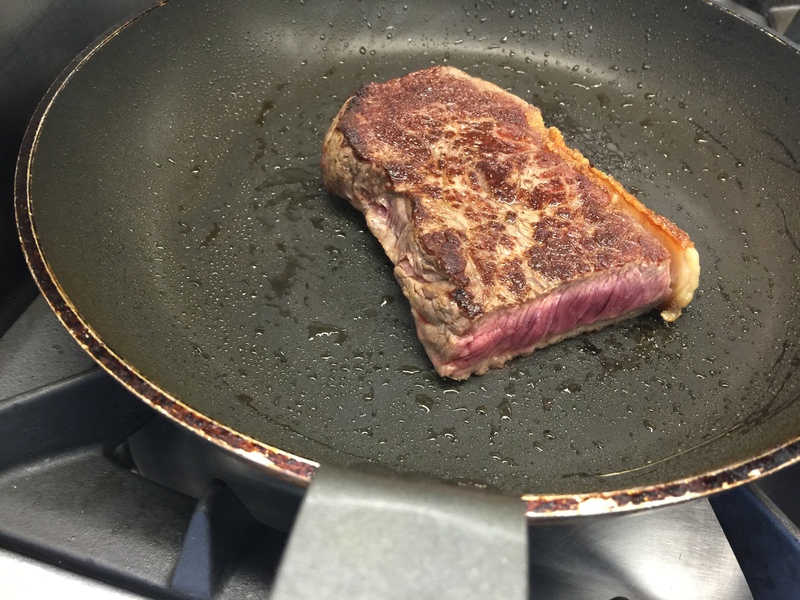 Most of us at home have heat and a decent heavy-based frying pan, essential for great steak results. 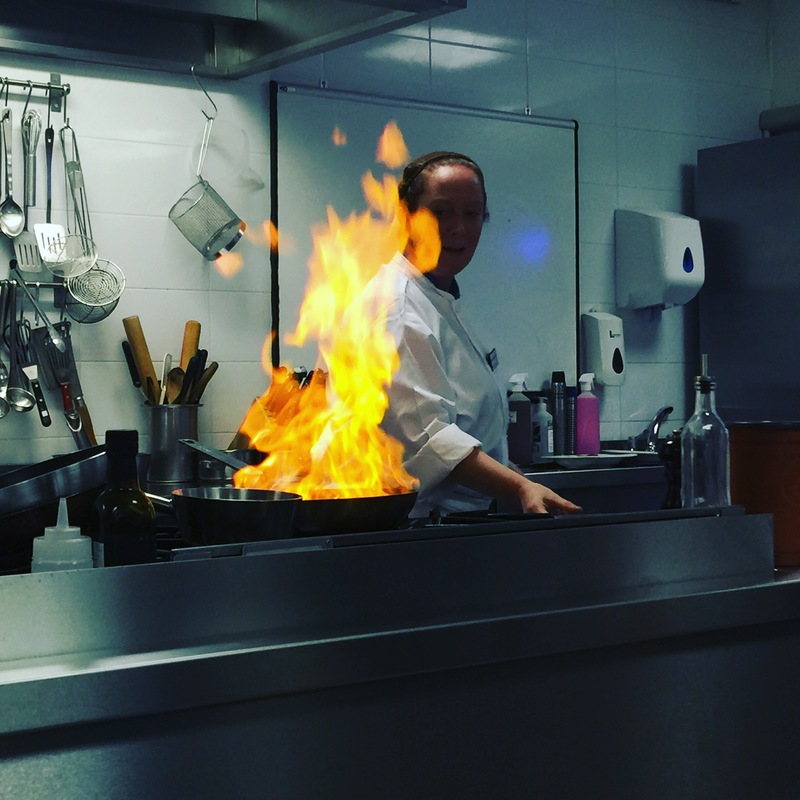 Leith’s Cookery School run a series of one day classes which help overcome fears in the kitchen and their ‘Learn How To Cook The Perfect Steak’ course is one of them. 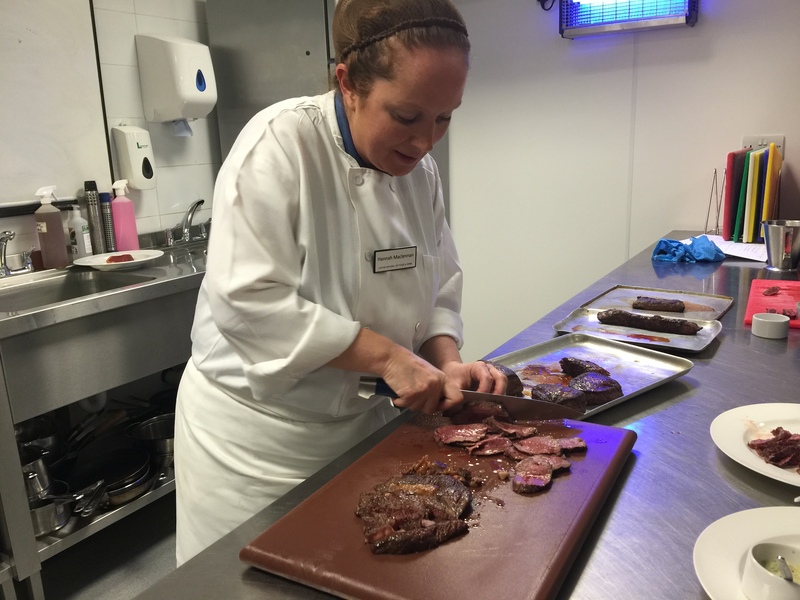 Focusing on a variety of beef cuts, our brilliant tutor Hannah Maclennan talks us through a table full of meat, explaining each and how they’re cooked – from rare to well-done. 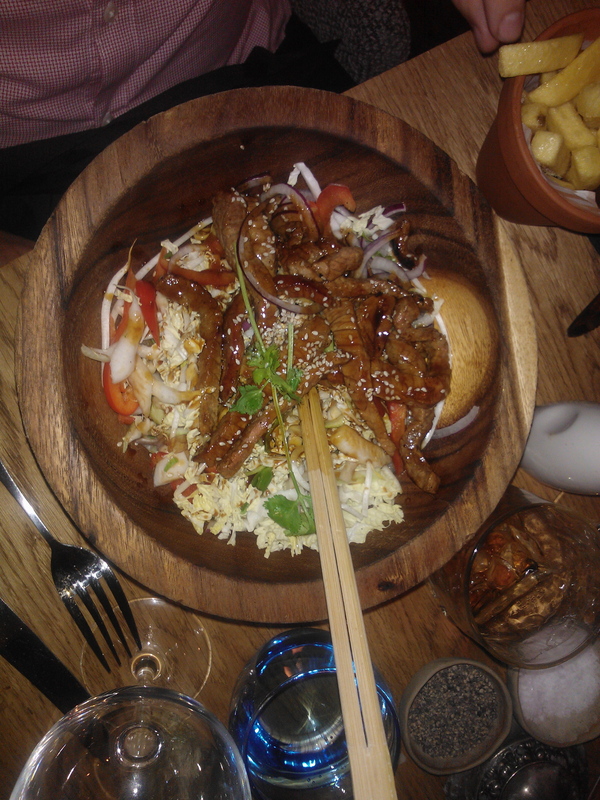 They were then pan-fried, some oven-finished and we get to try them all – from skirt steak to a cheeky piece of venison. She whips up a béarnaise sauce by hand and then by a processor and I’m in love. Her peppercorn sauce isn’t bad either and the added pyrotechnic display a bonus. 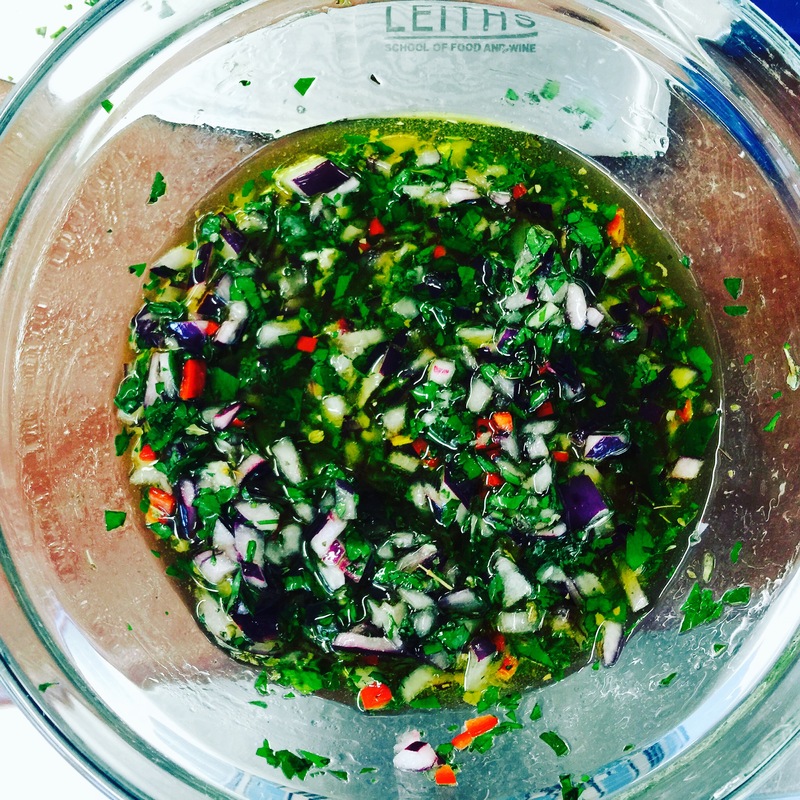 We move upstairs to the kitchen where we’re all shown how to make a chimichurri sauce and given some top tips, including this on how to make your garlic clove into a paste. We’re each given a sirloin steak, and left to our own devices to cook it just how we like. Mine is rare and I’m chuffed with the results. Over come chips and shallots and we tuck into our hard work. If you’re a fan of the supermarket you may want to read Tony Naylor’s Guardian piece about the best and worst steak on offer – as I said at the start of this piece, butchers all the way and the results of his taste test tend to back it up. Confident about cooking steak? You bet. Hands up who wants steak and chips at mine? I was a guest of Leith’s School of Food and Wine. 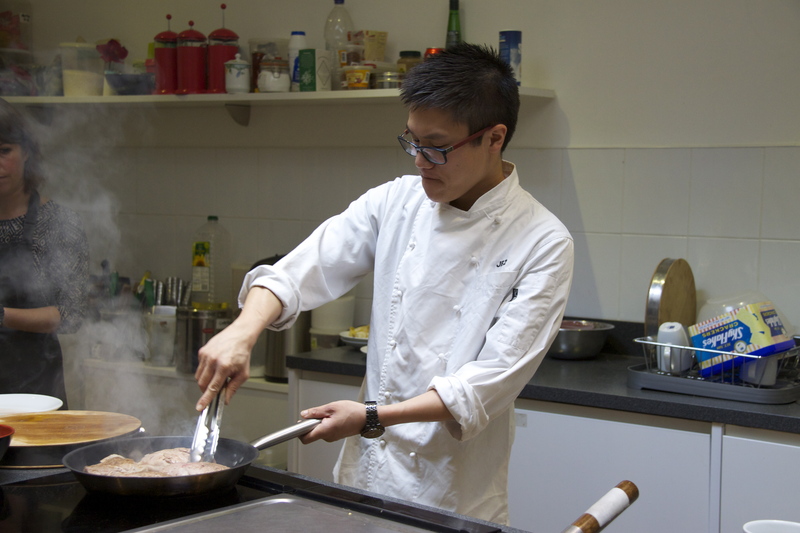 The set up in Jeremy Pang’s kitchen at the School of Wok is sure to make any chef or ambitious home cook green with envy. He’s got high spec electric appliances from AEG which include a steam oven to make sure his buns are lovely and fluffy, an induction hob with wok stand which heats to high temperatures within a blink of an eye and to top that he’s got a Teppan Yaki. It’s basically an iron griddle used to cook food from the Japanese Teppan (iron plate) and Yaki (grilled, broiled or pan-fried). As I tried to pick apart his love for electric induction over gas, after trying it, I couldn’t find a fault. It heats to temperature fast, loses heat quickly when the pan is taken away and so it’s just a matter of getting used to temperature control. They’re also very easy to keep clean as it’s the pan that heats and not the hob, splashes and spills don’t tend to burn onto the surface. 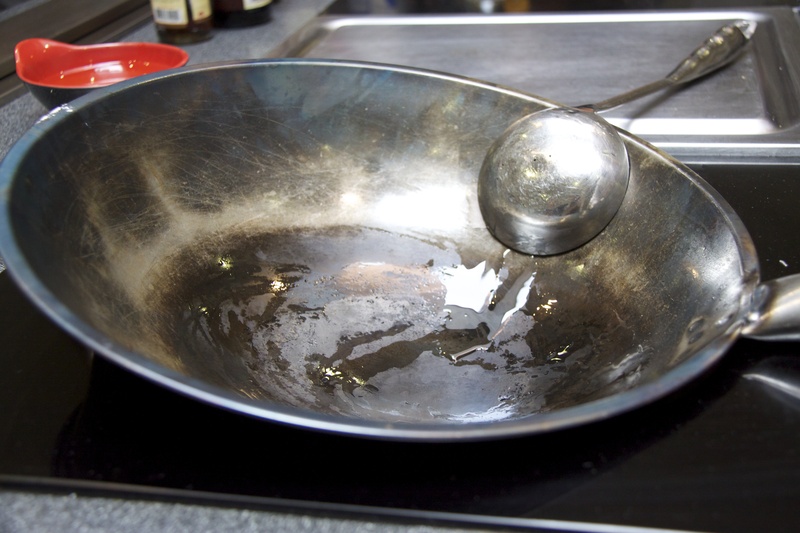 You do need iron-based pans – the rule of thumb is that if they stick to a magnet they’re perfect. 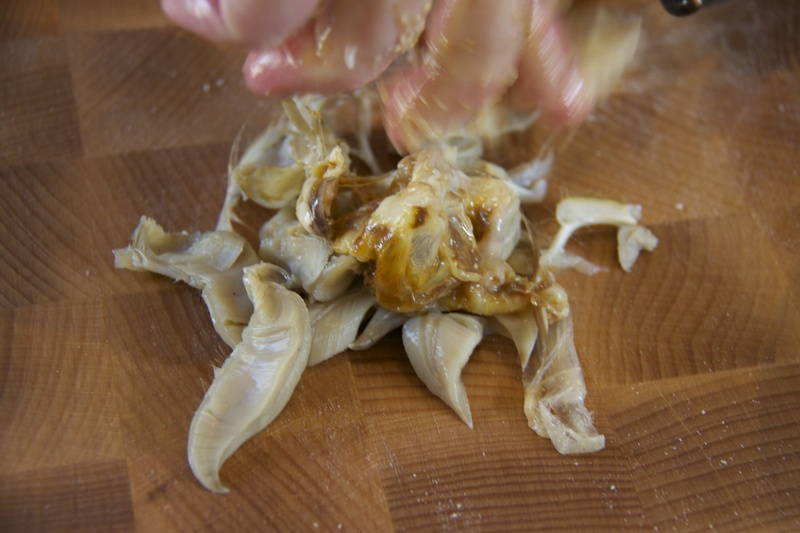 learning how to blanch and crisp a duck skin – all in about an hour and half. 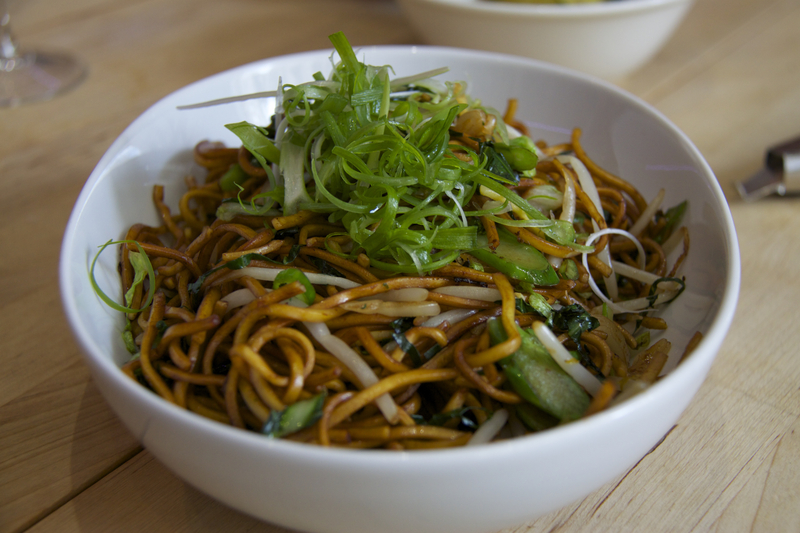 I thought I knew how to create the perfect noodle dish, sauce covering every noodle, but I didn’t. 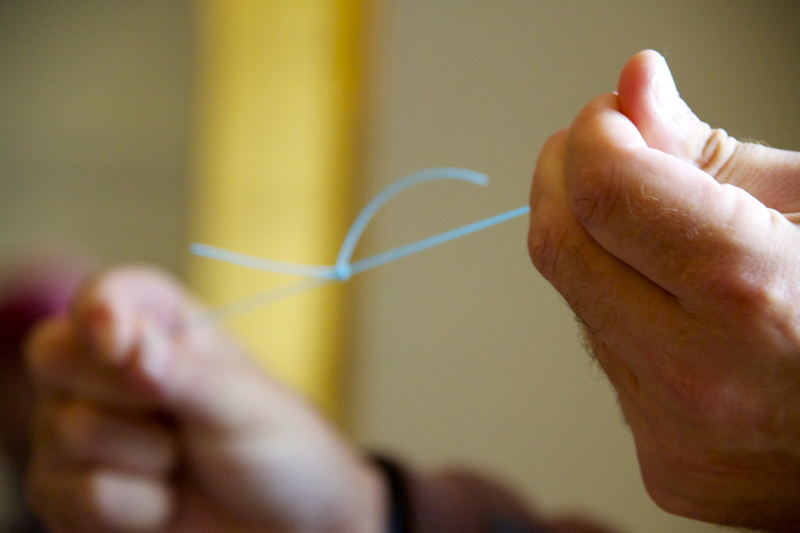 It’s definitely all about the wrist action and if you want to know how, get down to one of Jeremy’s classes. 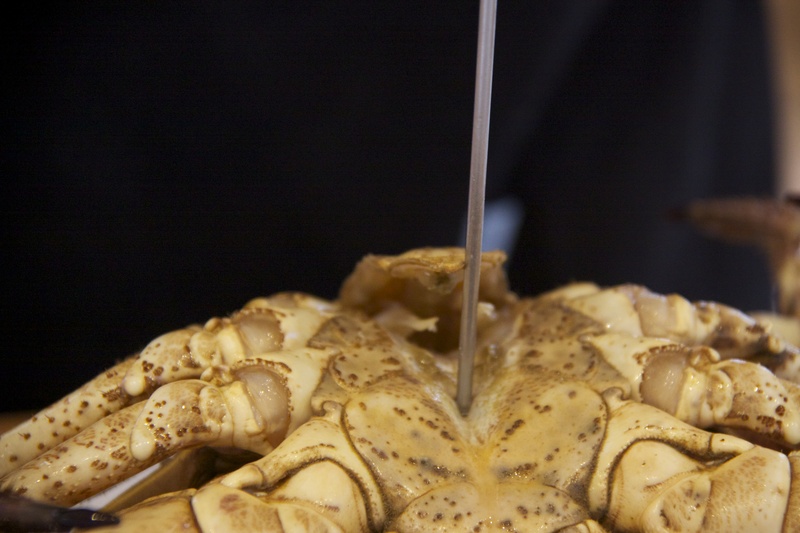 I’ll definitely be back for a few lessons if not the Flavours of China Tour – next year’s February class coincides with the last day of Chinese New Year – fabulous. We were all so hungry by the time we’d plated up our three dishes – Vegetarian Wonton; Hong Kong Noodles and Duck Pancakes with pickled cucumber that I forgot to take a picture of them. 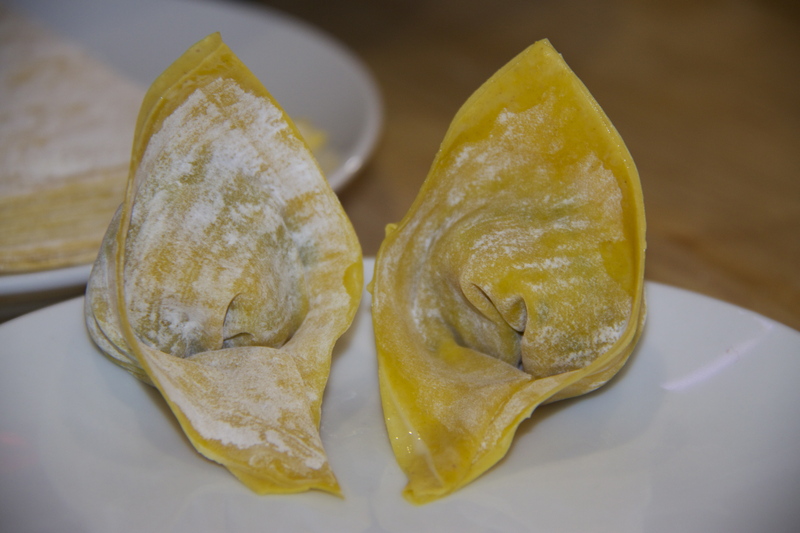 Here’s Jeremy’s recipe for the wonton – option to deep fry or steam. Here’s Jeremy making wontons for Blue Dragon – go about 0.38 seconds in to see his folding technique. 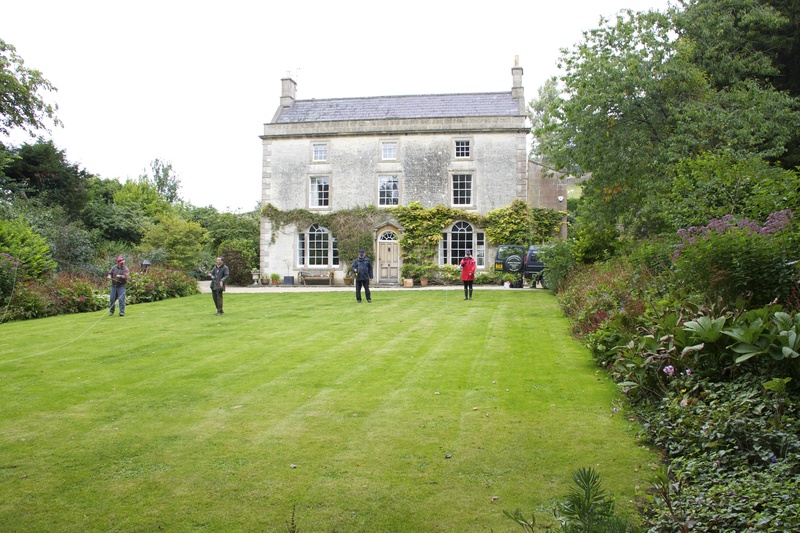 It’s only an hour and a half from London Paddington to Bath Spa on the train and Vale House Kitchen is a short taxi ride away in the pretty village of Timsbury. 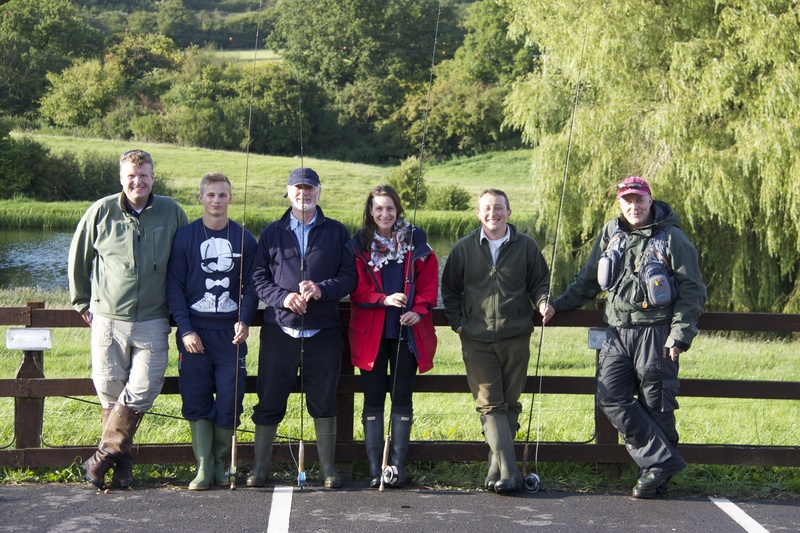 This country skills and cookery school is offering punters the chance to learn fly fishing and shooting skills, foraging, chutney and jam making, bread making, seasonal cookery and a whole bunch more. Bod and Annie Griffiths who live in Vale House, have employed the best teachers in the area to run their courses, with the chef Tim Maddams acting as the Head Tutor. 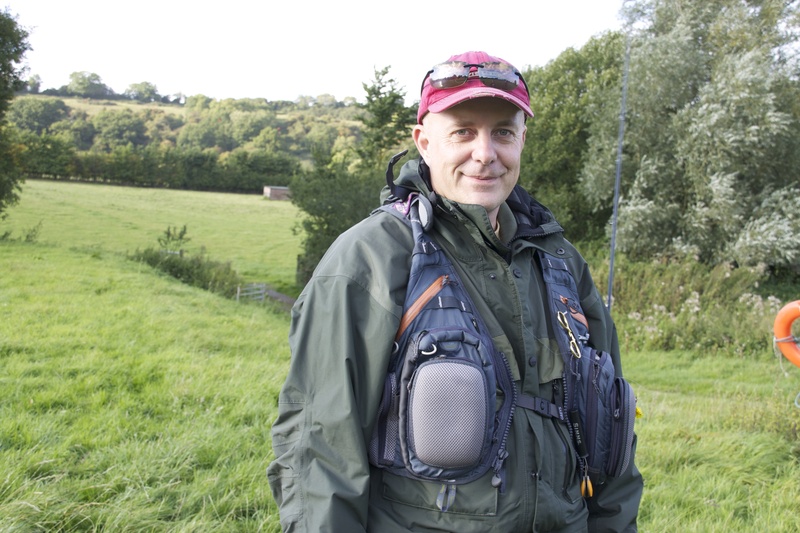 No stranger to teaching hundreds of thousands of people how to cook, if you’re a fan of Hugh Fearnley-Whittingstall then you’ll know Tim, he’s featured on many River Cottage programmes. The Vale House high-spec kitchen is in the eaves of a converted block which sits neatly behind the magnificent family home. There are separate work stations with plenty of room for students to work, on some of the best equipment money can buy. 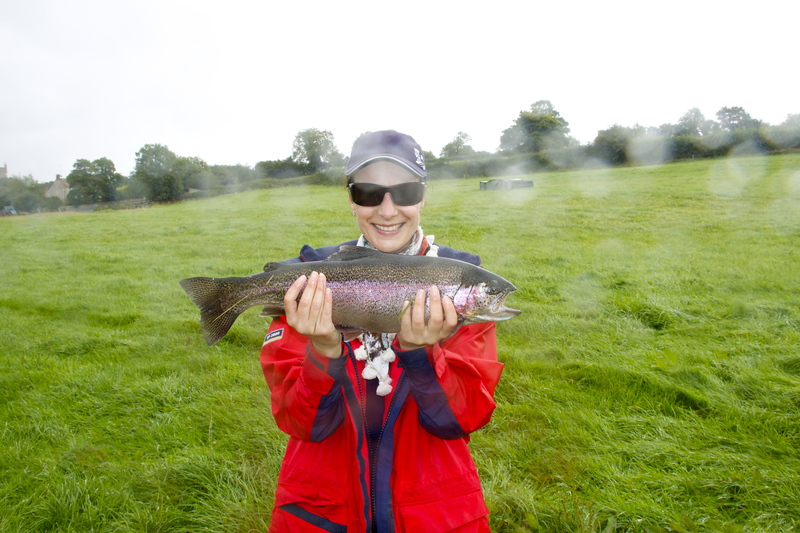 I’m here as a guest on the Fly Fishing Experience a 2-day course which introduces you to the skills of fishing on the fly on day 1 and how to handle and cook your catch, along with other fish dishes, including information on how to choose and buy fish responsibly on day 2. 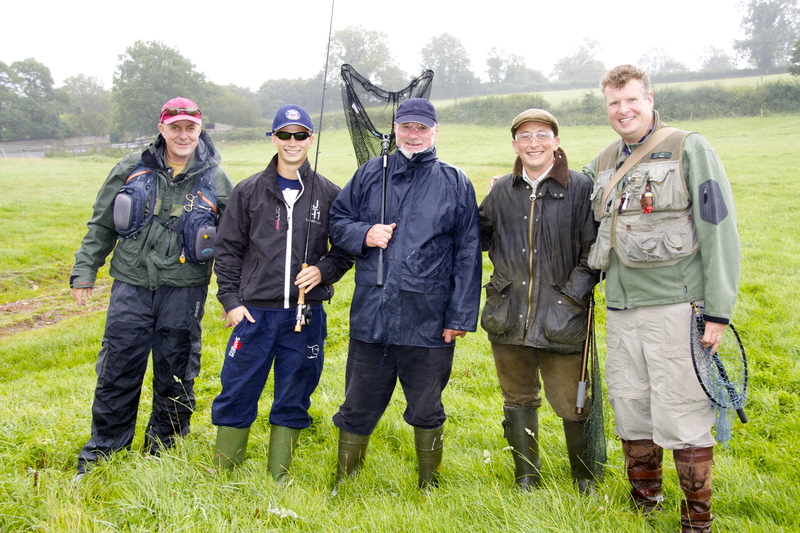 I am desperate to try my hand at fly-fishing with one of the foremost experts in the field and I wish my instructor Neil the Best of British. Clumsy, ham-fisted and un-coordinated are just a few of the adjectives that sum up my beach fishing expeditions as a teenager so I’m not holding out much hope when it comes to fishing on the fly. 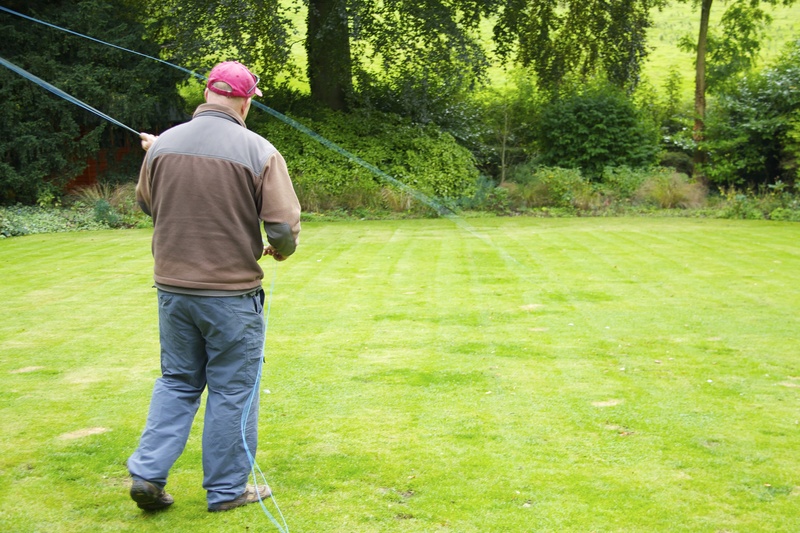 Our patient, kindly tutor Neil Keep is struggling with a sore throat, the wind and sideways rain add little to help him explain the casting we’ll be putting in practice on a lake in the afternoon. Just for now, we’re on the lawn in the front of Vale House. I’m the only woman here on the course with three others all of mixed ability, and Bod is managing the day with his wife Annie and gorgeous son who pop out occasionally with cups of warming coffee and biscuits. 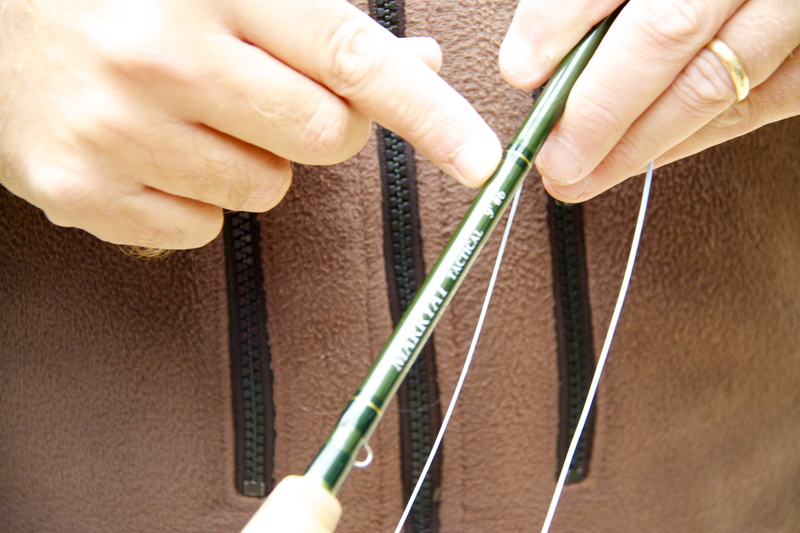 We’re taught to forward cast – the fly is whisked into the air, over the shoulder, until the line is almost straight and it’s then flicked forward using the forearm. 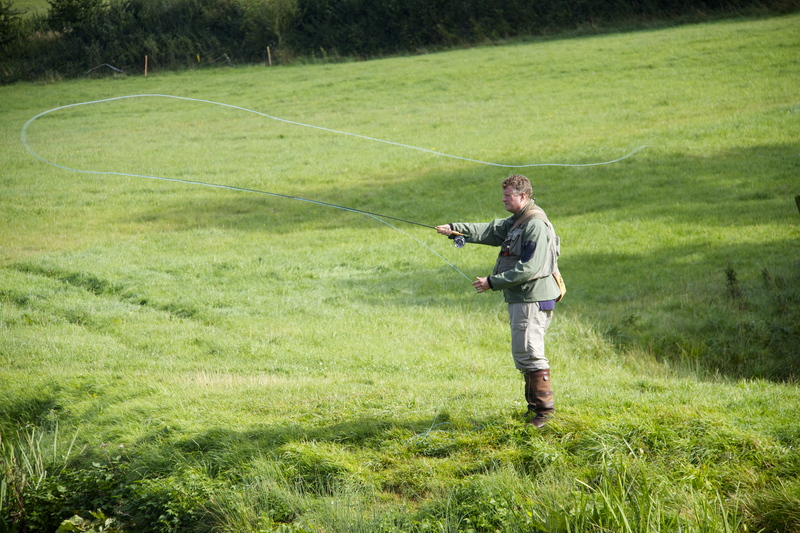 I learn very quickly th my technique of flicking back and forward not only doesn’t get the fly very far into the ‘water’ but it tends to get caught on grass and bushes immediately behind me. There really is a knack to it. And I finally get the hang of it, but only just. When the rain gets a little too much and our arms begin to ache, we’re taken into the dining room for lunch. 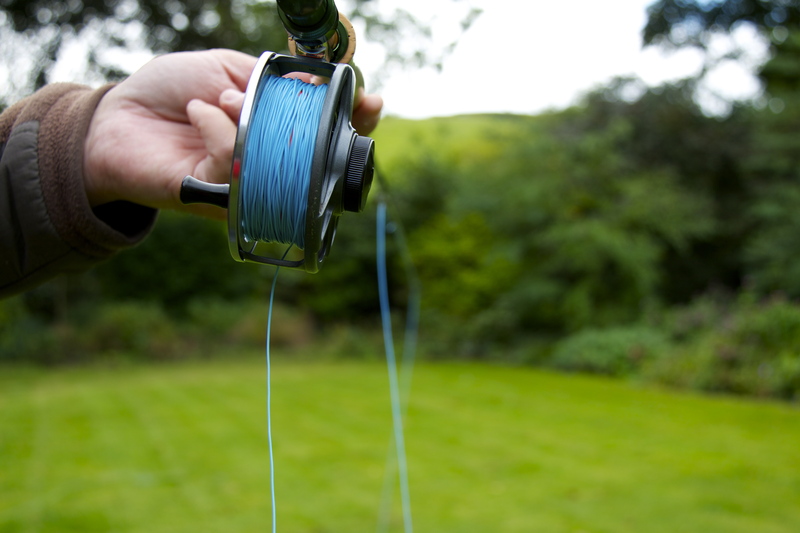 We’re allowed some of Bod’s homemade fish pie when we’ve mastered the art of knot-tying – it’s a Blood Knot that usually ensures the fly is secure to the line then we make our way to Cameley Lakes to try our skills on the water. 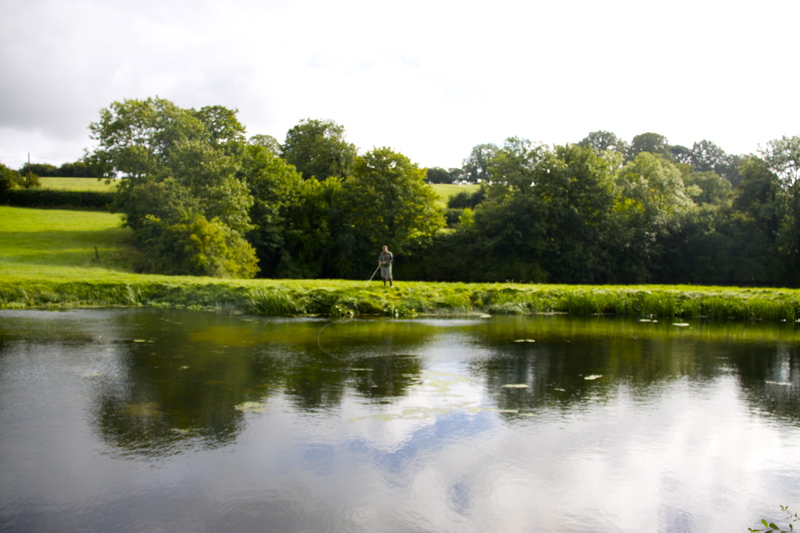 We’re told the lakes are well-stocked and once we wear Polaroid glasses we see large brown and rainbow trout passing the time of day feet away from the bank. 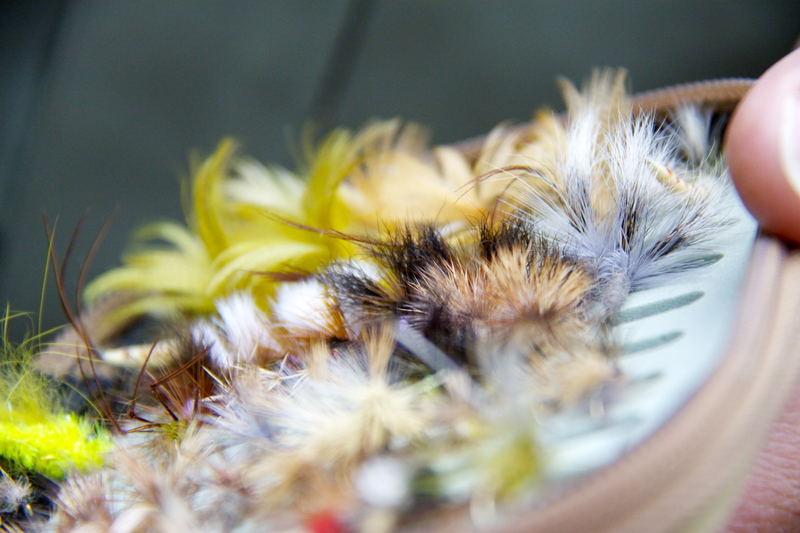 I cast, with a Crane Fly (daddy-long-legs to me) and to my total surprise, and that of the men, I get a bite. Three minutes later I’ve teased in a rainbow trout that’s almost 5lbs. We have no more luck but leave with one fish and a large bag of sloes we free from a nearby Blackthorn Bush, we’re driven back to our B&B for a much-needed hot bath and a good night’s sleep. The next morning, we’re collected by Bod for round two. Just three of us have made it through to the fish cooking and the first thing we see is how to gut the fish I caught. 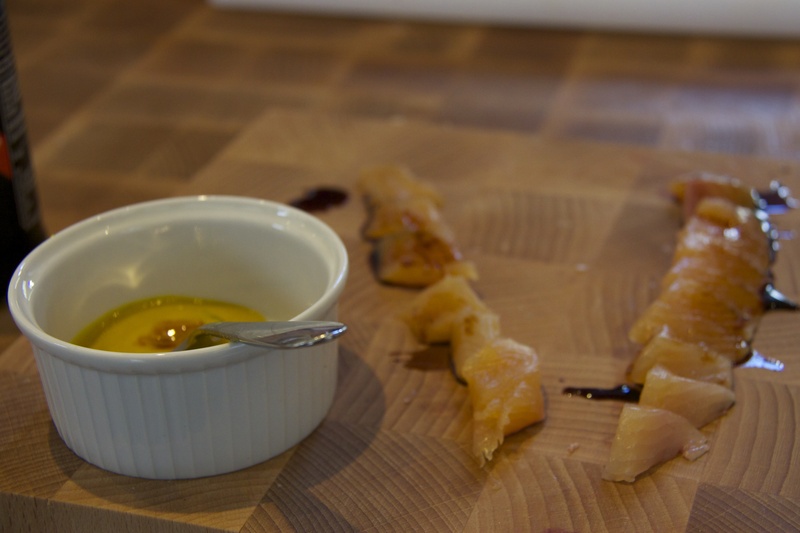 We’re treated to some trout sashimi with a little soy sauce and English mustard dip – Tim says you really need to know where the fish is from and how old it is before you prepare to eat it raw. 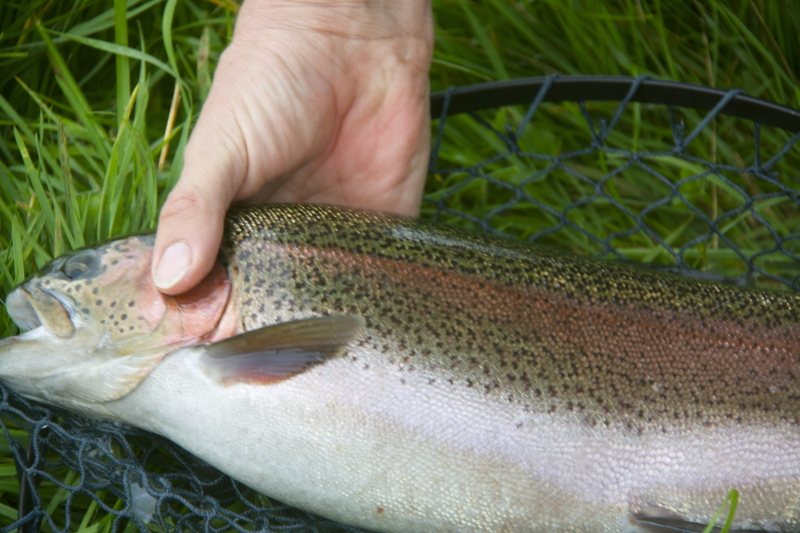 Luckily this trout is from a local supplier, who also happens to be on the course, so if it was any fresher we’d have to slap it. 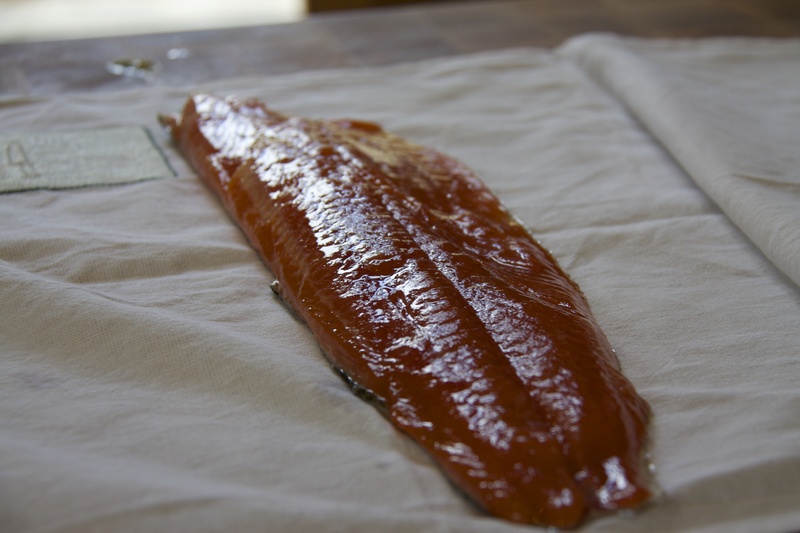 before it’s smoked in an electric smoker. and knocks up an impressive liver pate which we scoff before I get the chance to take any photographs. The two dishes weren’t even on the curriculum and that’s what I love about the teaching method at Vale House it’s free-form instruction with top tips as you go and it’s something I’ve not experienced on past cookery course. There’s a structure to both days but it’s not at all regimented, quite relaxed and it’s a fun atmosphere to learn. Tim’s a fascinating man and he’s hugely passionate about ethically produced, sustainable, locally sourced food and this is core to everything he does. He’s still involved in Hugh’s Fish Fight and explains to us what fish we must be asking the fishmonger and the questions we need to ask about its provenance. 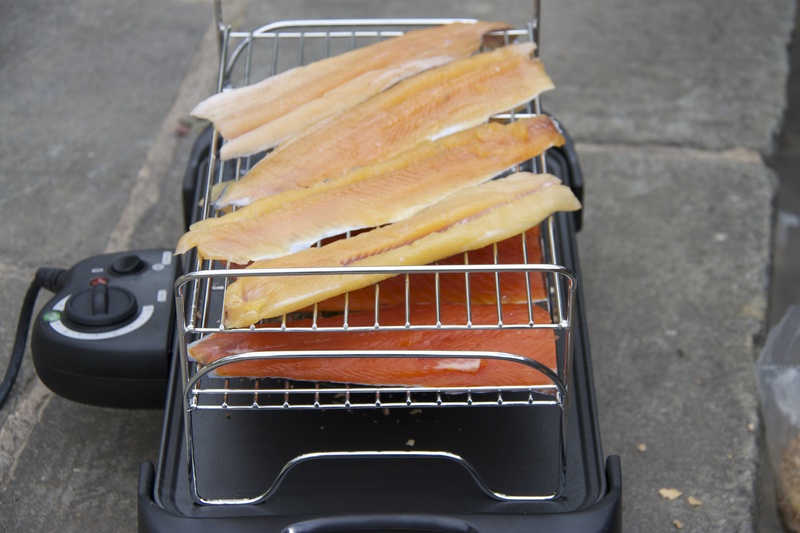 The fish takes around 15 minutes to smoke and takes on a lovely flavour. 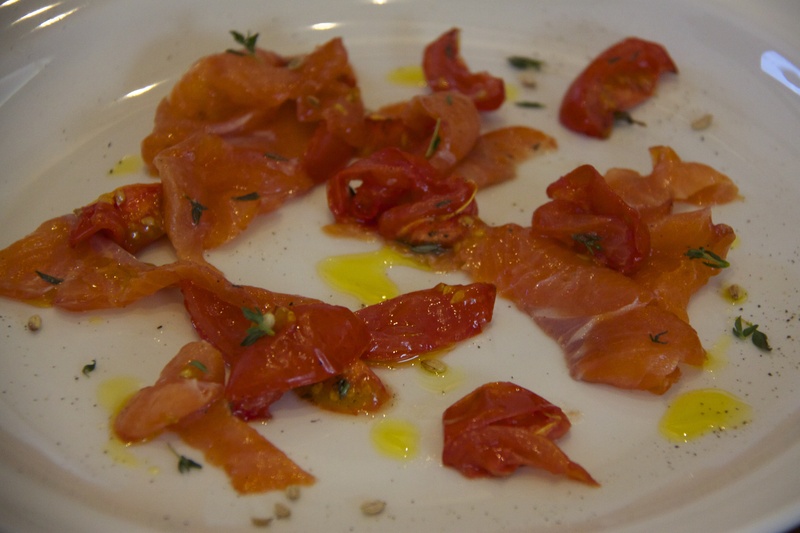 Our first dish is a smoked trout and roasted tomato salad, dotted with local Rapeseed Oil from Bath Harvest. 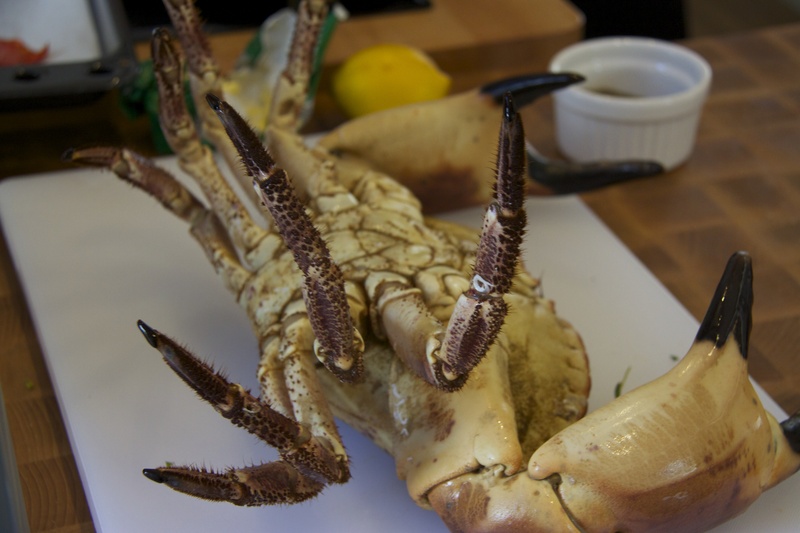 Crab and mussels are a little scarce inland so Bod orders a box of fish and shellfish from Cornwall and we marvel at the size of the crabs. 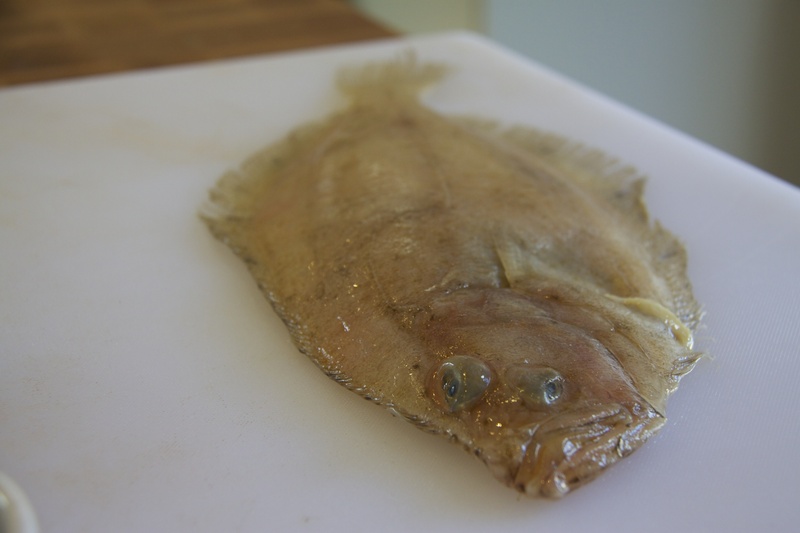 We learn to fillet a flat fish. 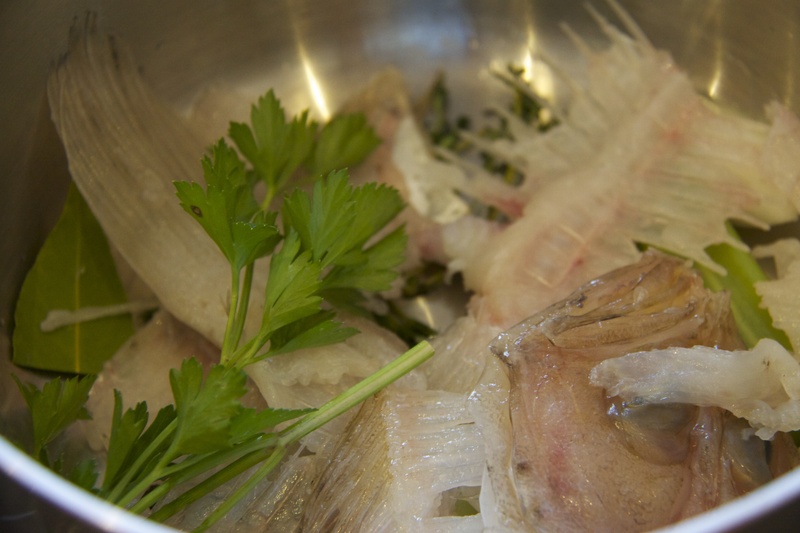 and we make a fish stock with everything left after we’ve filleted it. 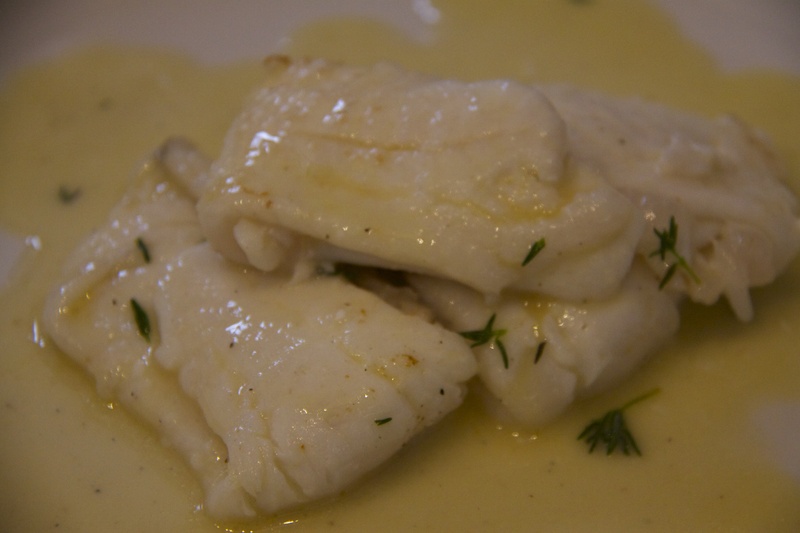 and Tim’s take on a sole Meunière, for lunch. and the grey gills from the body, often called ‘dead man’s fingers’, not because you’ll die if you eat them but because they’re very tough and indigestible. 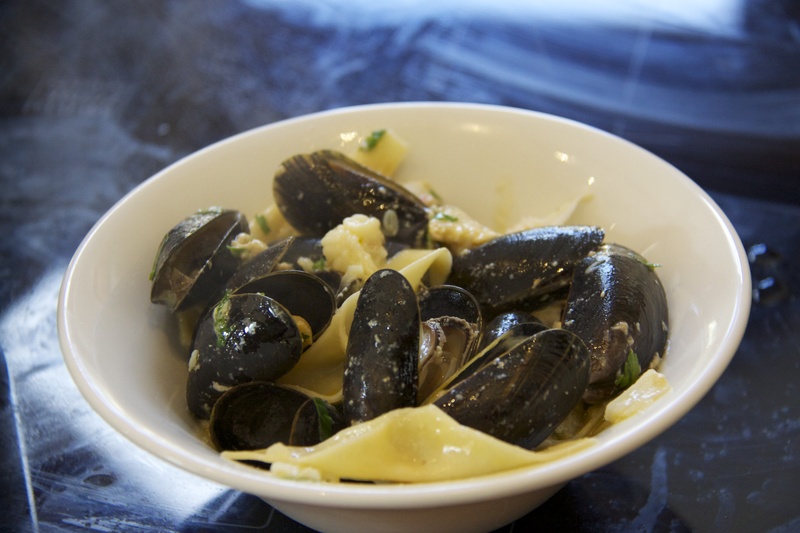 and make a tasty crab, mussel and chilli pasta dish. 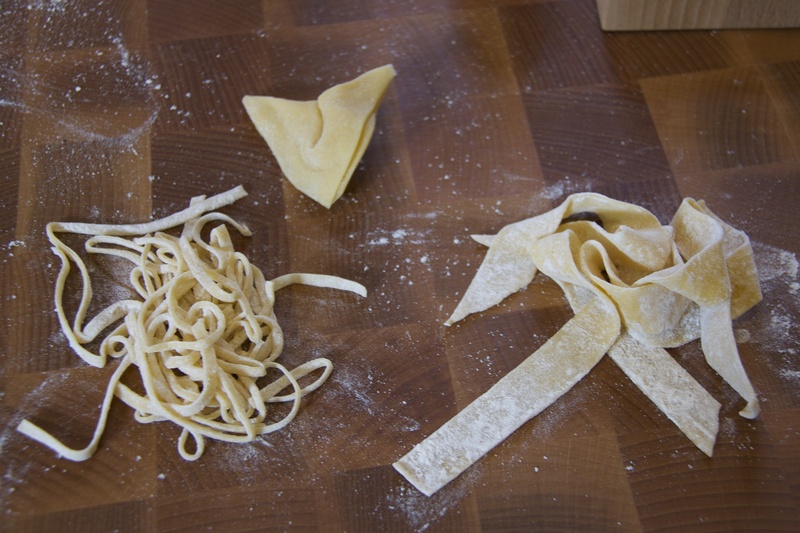 I ask Tim about other shapes to make by hand with the pasta dough and he shows me a few without hesitation. Tim has a fabulous way with his students and a great sense of humour coupled with plenty of patience and the day goes far too quickly, our group bonds so well, it actually feels like we’ve known each other forever. We discover who gets the scraps we’ve been saving throughout the day – chickens and pigs feast on the leftovers that won’t make them poorly. I’ll definitely be returning to Vale House Kitchen but with Mr – I just know the Pig Butchery will be right up his street. There are so many things I’d like to do from jam making to wedding cake decoration, if only I lived nearer, I think I’d end up becoming an extended member of the Vale House Family. 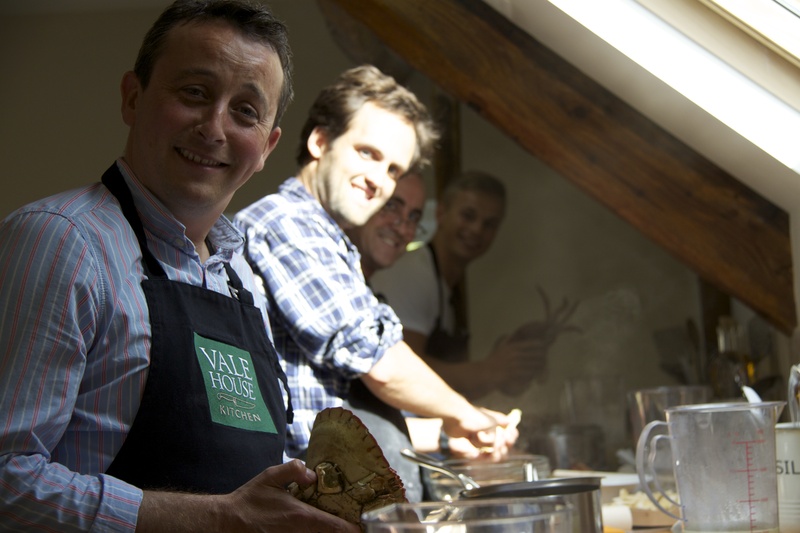 If you’re visiting Bath or indeed Bristol, why not book a one day or two day course at Vale House Kitchen, country pubs, long walks and new skills, what’s not to love? 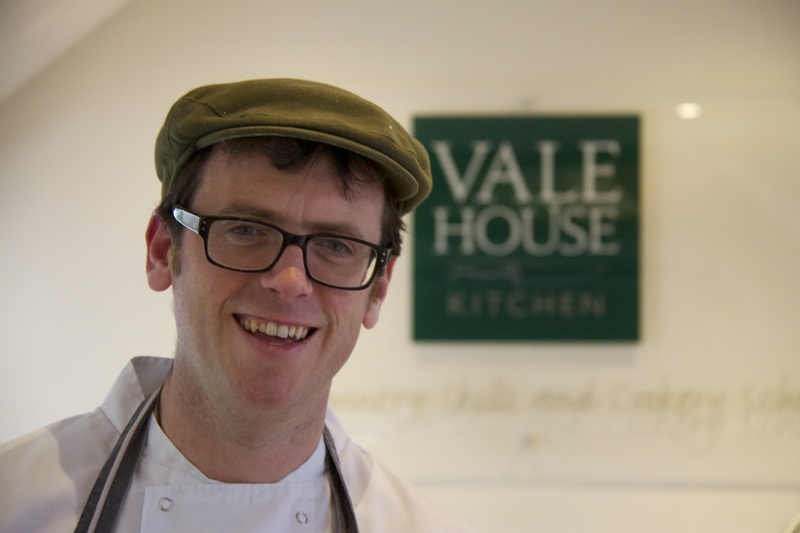 Tim runs his own creative food company Green Sauce so caters for parties (and weddings if you can secure him) as well as teaching at Vale House Kitchen and at River Cottage. I rarely win anything whether it’s a raffle, a silent auction, or a village fete tombola, so I was gobsmacked when I heard I’d won a dinner for four people and a cocktail-mixing session in an Action Against Hunger raffle at Cookery School at Little Portland Street. I could pick from a selection of restaurants in London from the restaurant group Drake and Morgan – The Anthologist and The Parlour both in the City; The Folly in St Paul’s; The Refinery on Bankside or The Drift in Heron Tower. I chose The Anthologist and managed to get four of us together on a Friday evening and it begins with the Mixology Class. 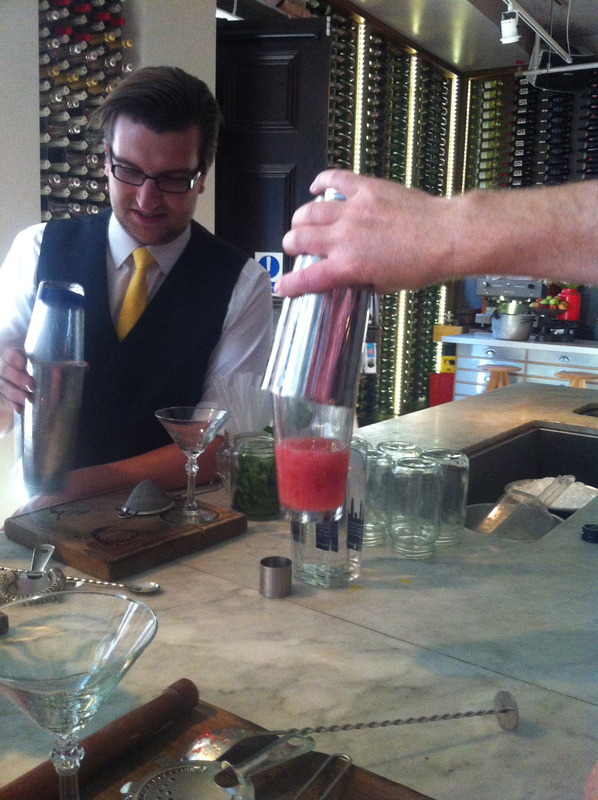 We learn to mix and muddle two great tasting cocktails The Clover Club and a classic Mojito with a twist. 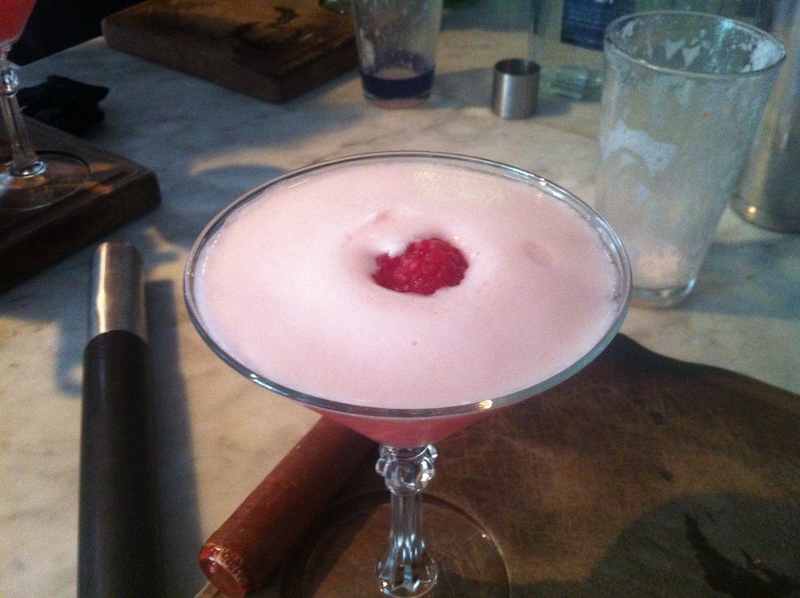 The Clover Club is a ‘sour’ a raspberry cocktail with a little sugar syrup, lime juice and the white of an egg. 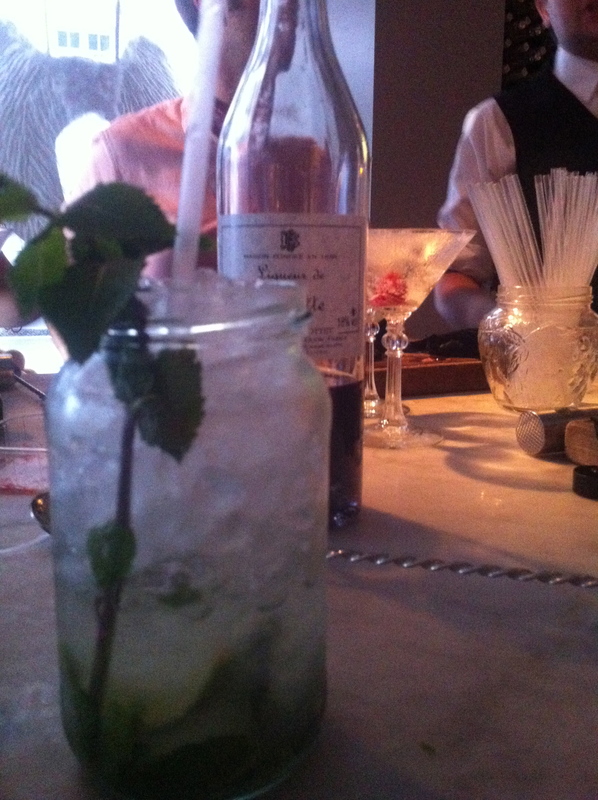 The Mojito was ‘twisted’ with Cointreau or Violette liqueur and I made the latter – delicious. The lesson was great fun and I couldn’t recommend it more, the classes are usually for 5 or more. After our hour-long session, we made our way to the table – right at the front near the pass – with Martin Manning, Head Chef working his magic not behind the pass but in front of it. 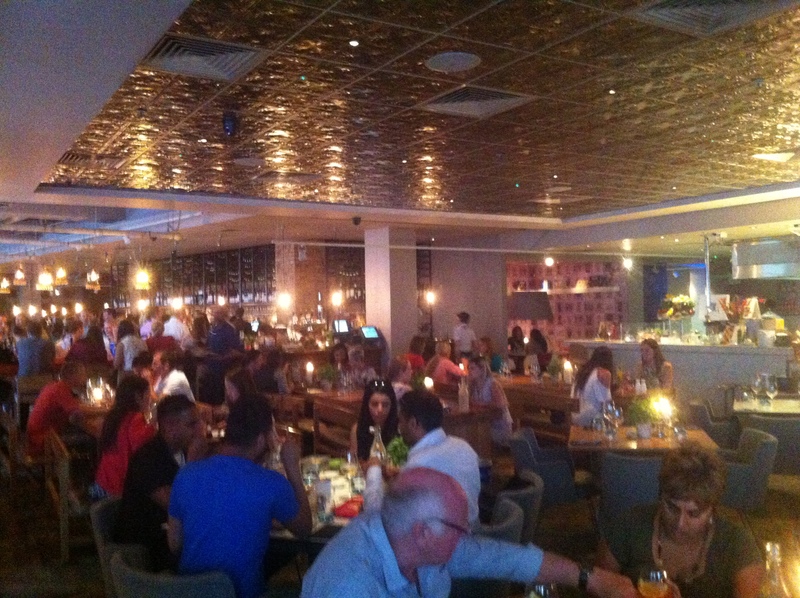 The restaurant is huge but the buzzing atmosphere fills it with ease and I’m annoyed I’ve not found it sooner. A short tube ride to St Paul’s on the Central Line and a wiggle past the Cathedral and some great street names (Bread Street – London’s former ancient Bread Market) and hidden gems and you’re there. He comes and explains a little bit about the menu which has so much choice, split up into sections; Woods, Pastures and Gardens; Large plates; Flatbreads and sharing boards; Sandwiches and Po-Boys and Steaks and the Steak and Burger Bar. An A3 sized menu has everything you could possibly want to eat on it and there are specials on a blackboard. 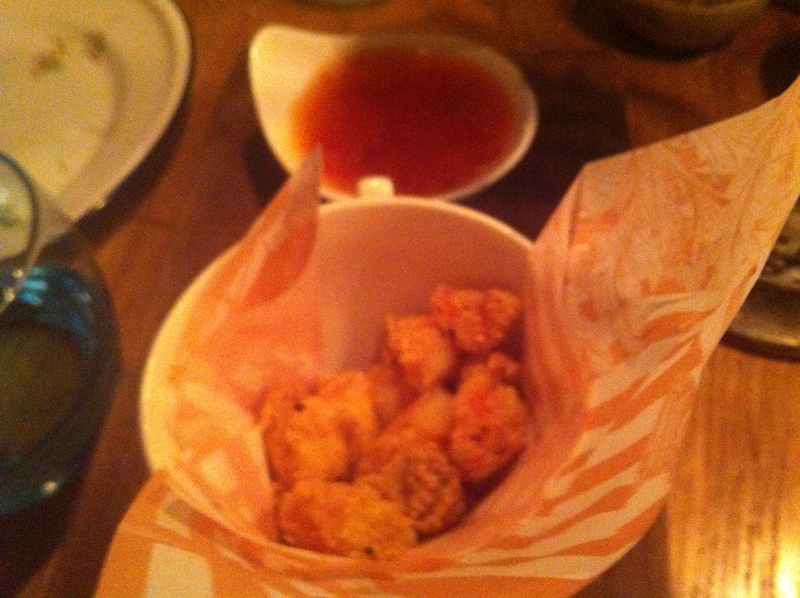 Prawn popcorn served with a chilli dip also (£6.95). We also got some Flambé scallops (which were supposed to be cooked at the table – retro seventies style) but this didn’t happen. Maybe the ‘Culinary Kitchen’ was taking a night off (in fact I have no idea why this didn’t happen) nonetheless they were superb and worth every penny of their (£19.95). 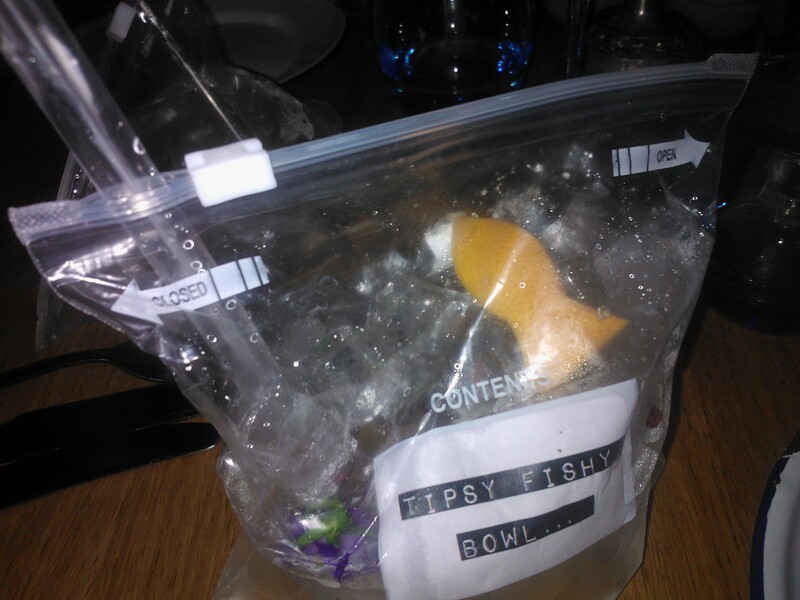 The ‘Goldfish in a Bag’ is a brilliant take on the once most-wanted fairground prize. 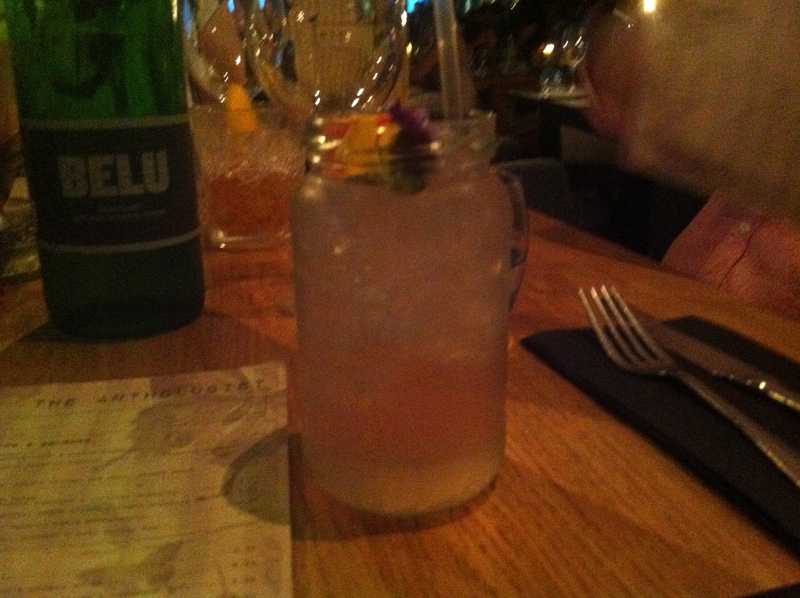 It’s made with Little Bird Gin; Hangar One Vodka Mandarin; Rhubarb Bitters; and Fever Tree tonic with edible lily pads (pansies) and the all-important fish (grapefruit skin). roasted butternut squash, red onion, goat’s cheese, spinach and roasted pecans. Pleasant enough, but the base was way too thick for the topping and it was dry. 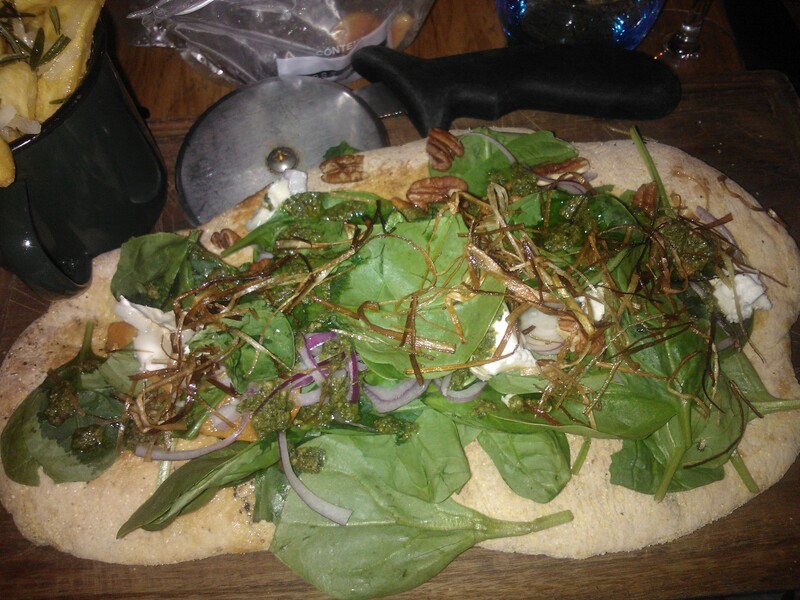 I ended up leaving the bread and scraping off the topping which was tasty (£9.95). 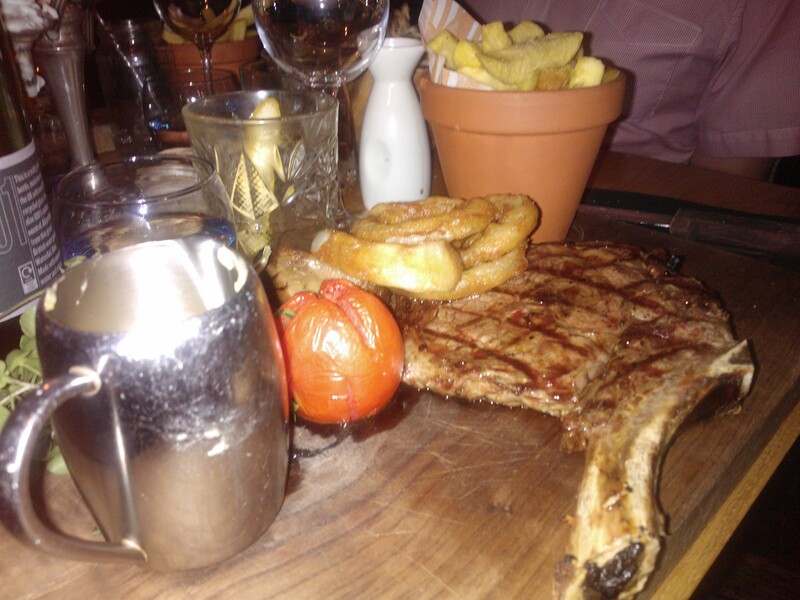 Mr had the Cote du Boeuf (20.95) cooked medium rare with Bearnaise Sauce (£2.50) with that he took a side of chips (£2.95) and loved it all, the onion rings were very impressive. 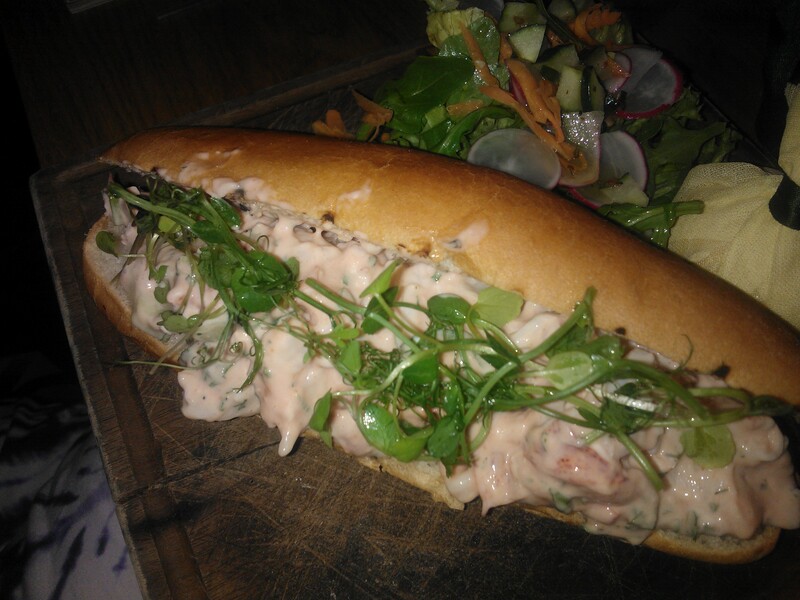 Sarah had the Lobster Po-Boy (£19.95) served in a brioche hot dog roll, it wasn’t shy of the marie-rose sauce and came with a small side salad of fennel & spring onion salad. We just had to order the Roman Fries (there’s a whole section on “Tatties”) which were served with parmesan, truffle oil and rosemary. 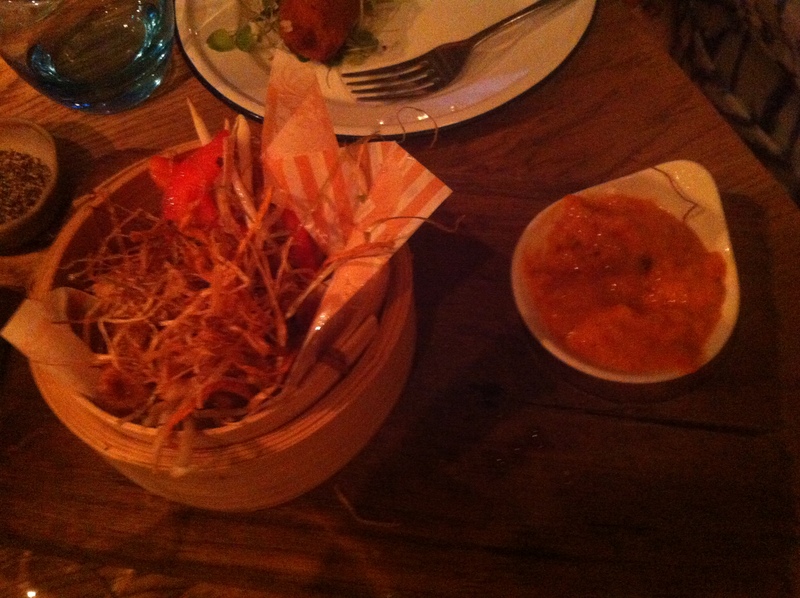 These were exquisitely good (£4.95) and I could have eaten another portion with ease. For those watching their weight – there are a few recipes on the menu under 500 calories – but only a few. I don’t think you’d come here if you were watching your weight anyway – there’s too much in the way of temptation. 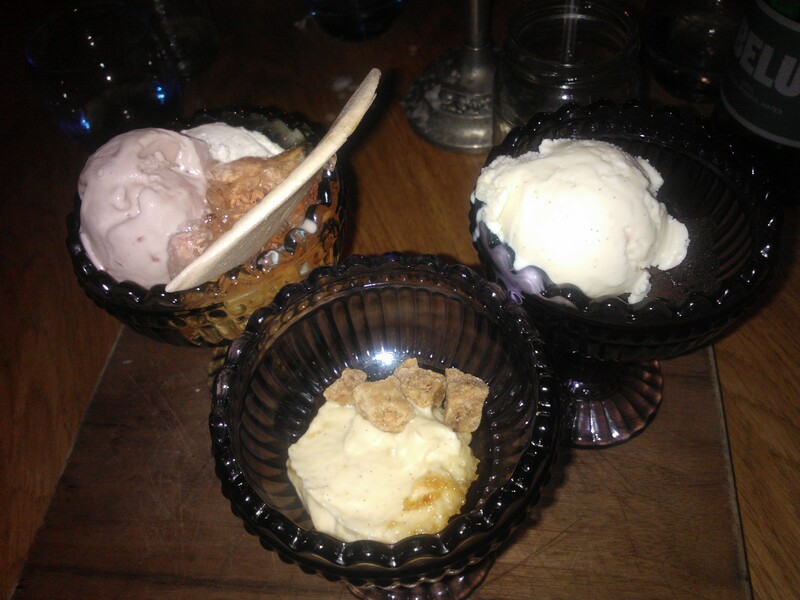 Desserts were pretty inventive too and we treated ourselves to a Pudding Shot (£7.95) – a trio of chocolate brownie, toffee apple crème brulee & berry trifle sundae – the latter was my favourite. No one could eat more but a Milkshake isn’t really a dessert is it? So, I ordered the Salted Caramel Milkshake (£7.50) because if was curious it was a delicious mix of bourbon whisky, salted caramel, vanilla ice cream and chocolate bitters. It was fantastic and helped me home in a taxi. 2 fish in a bag cocktails (£8.95) Toby had just a Jack and Diet Coke (5.20) Mr also had a glass of Chilean Ochagavia 1851 Cabernet Sauvignon Reserva with his steak (£6.95). We had still water (£3.60) and a bottle of sparkling (£3.60). Friday night is RnB night with the Resident DJ ‘Wonder K’ and this is the place to come and let your hair down after a long week in the City. As the hits started to spin so too did the clientele, loosening up their ties, shirts, and hips on the dance floor, choosing to eat generous bar snacks rather than a full-sit down meal. Our waitress was Gabrielle and was fabulous – the service was quick and painless and all the waiting staff deserved a share of the optional service charge. The bill arrived in a volume of Crime and Punishment, which was ironic because I didn’t think it was punishing on the wallet at all. For four, minus the Mixology Class, the total was £212.40 (with service) and even better as I only had to cough up £12.40 – it was a generous prize. Would I return? Absolutely. I’d have no hesitation in recommending The Anthologist as a fun place with decent food and excellent cocktails right in the heart of the City. 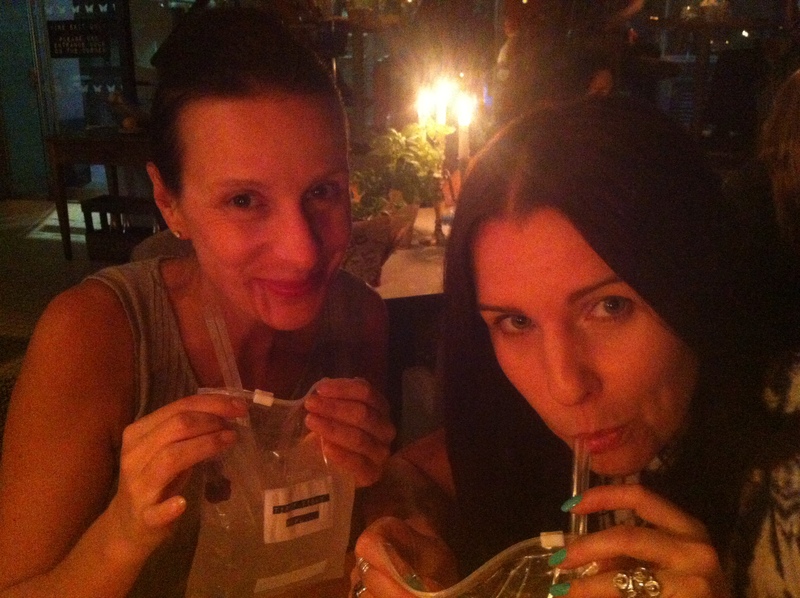 Thanks to The Anthologist for a wonderful evening and for the generous raffle prize. 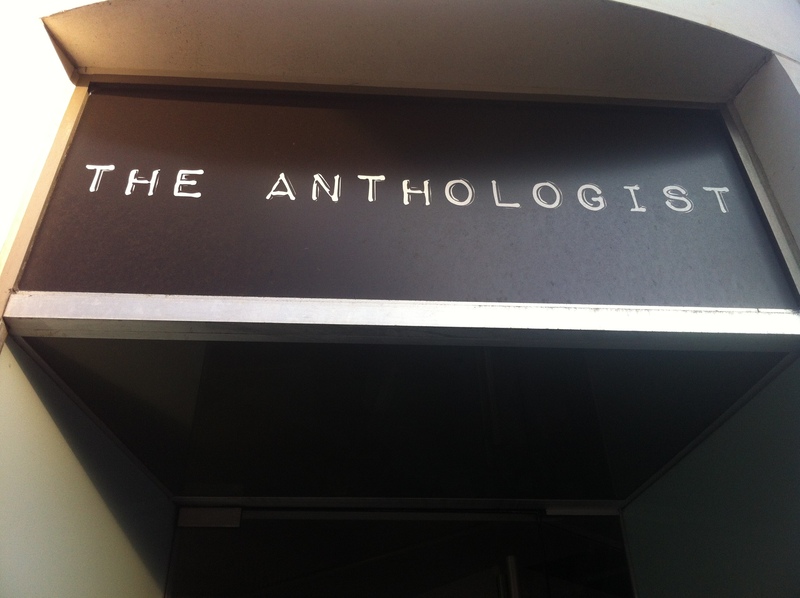 The Anthologist, nearest tube – Bank or St Paul’s. You’ll have seen them both on BBC 2’s Masterchef: The Professionals watching and ultimately judging the shaky-handed chefs who hope they have what it takes to measure up in a Michelin-starred kitchen. I’m talking about Michel Roux Jr and his sous chef Monica Galetti. It’s here at the Cactus Kitchens “Michel and Monica Experience” that I’m getting up close and personal with the talented pairing I usually see on my telly. And, do you know what? I know they won’t be reading this so I can say what I like – these two are the perfect partnership – a better looking, younger and funnier culinary version of the Chuckle Brothers without the ladders. Probably not so jolly inside the professional kitchen when service is in full swing, but we’re not, so they can get away with a lot – all for our entertainment. If you’ve watched the programme, they’re absolutely nothing like they’re edited for the audience – sorry. There is no good cop, bad cop here, just a perfect partnership, both chefs doting on each other’s talent. Mentor and protegé. Food lovers and worshippers of it. Monica is hilarious, Michel easily goaded and watching their chemistry in a kitchen is a joy to behold. And I’m here, right in the middle of it with a handful of other food lovers. If you know your fine dining establishments you’ll know about Michel and Monica and that they both work at Le Gavroche a two-starred Michelin restaurant in central London. Michel’s the boss and you can probably tell from the surname, member of the legendary Roux Family. Monica is his senior sous chef and she’s married to the restaurant Sommelier. She was born in Samoa and raised in New Zealand. She’s worked with Michel for more than a decade and in 2009 she became one of the Masterchef judges. This is an experience not being offered anywhere else in the country and whilst the £750 price tag may come with an initial “How much?” I can tell you it is worth every penny. Where else can you shoot the breeze about your cooking disasters with like-minded cooks, or have Michel Roux poke his head over your shoulder and admire your creme pat (not a euphemism) and have Monica answer your questions about turning out the perfect meringue with out-of-date egg whites? So, I hear you say, where can we get to take part in this amazing day? Cactus Kitchens is a brand new cookery school built in the Gods of a former chapel in Clapham and which by the way, also happens to be home to BBC One’s Saturday Kitchen studio. 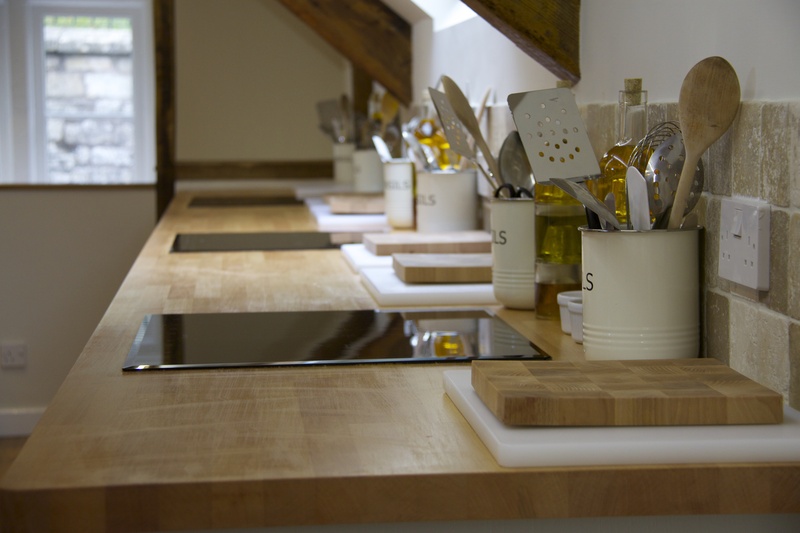 Each of the 12 individual cooking stations are fitted out with the finest equipment money can buy including induction hobs, ovens, razor-sharp Global knives, Kitchen Aid mixers and Green Pan cookware – all of which were given final approval by Mr Roux. So, what did I cook and what did I learn? 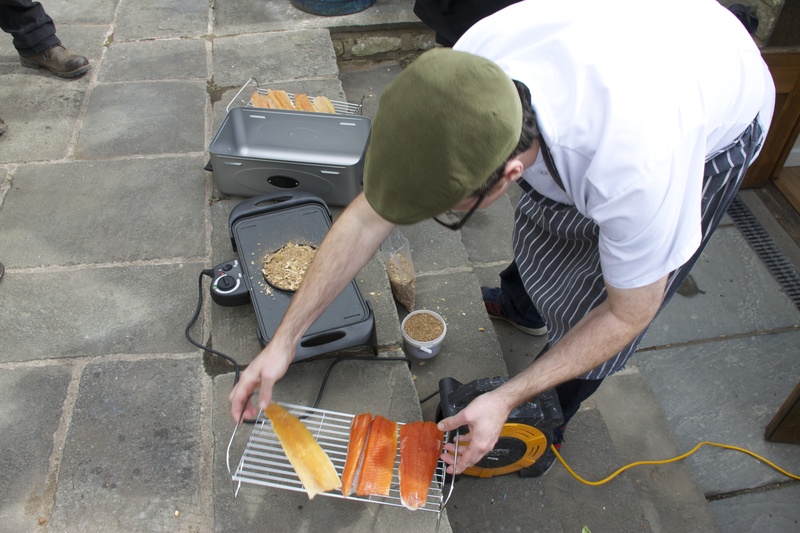 In simple terms, it’s all about the preparation your “mise en place”. Once you’ve got yourself sorted out there’s not too much that can go too wrong. The day begins with refreshments and delicious, homemade lemon and orange brownies (one word of caution, don’t eat anything at this point, as you’ll be eating all day). We were then taken up to the cookery school and it’s here we get to meet Michel and Monica after a brief introduction from the brainchild of the school, Amanda Ross. We’re given a run through of how the day will work and after we’re given a demonstration of our first item to prep then it’s back to our workstations to cook. All the clearing up is done by the lovely Geoff and the cookery school’s wonderful team of friendly staff. So you can be as messy as you like, although you are encouraged to clear your work surfaces as you go along. Sage words by experienced chefs. Michel pops in and says hello, very relaxed, no chef whites watches the first prep and then goes off to Le Gavroche to oversee the lunch service. All control is passed over to Monica which she handles magnificently well (that will be years of service working in the restaurant then). We spend the day watching the demonstration and prepping our dishes and Monica visits each workstation to see how students are getting on. The knives are razor-sharp and everything is brand new so lots of instruction on how to chop properly with fingers and nails out of blade reach. Our starter is mackerel with cauliflower puree and vegetables a la Grecque. 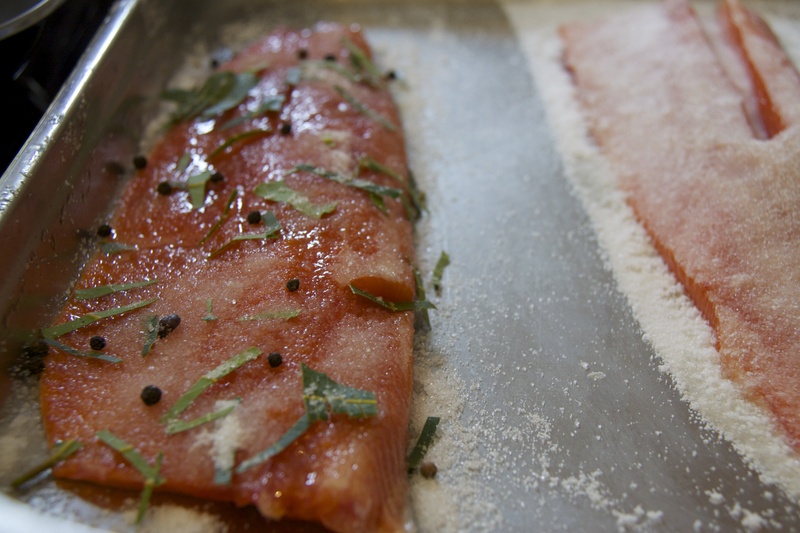 All the fish prep is done, pin boned and filleted. 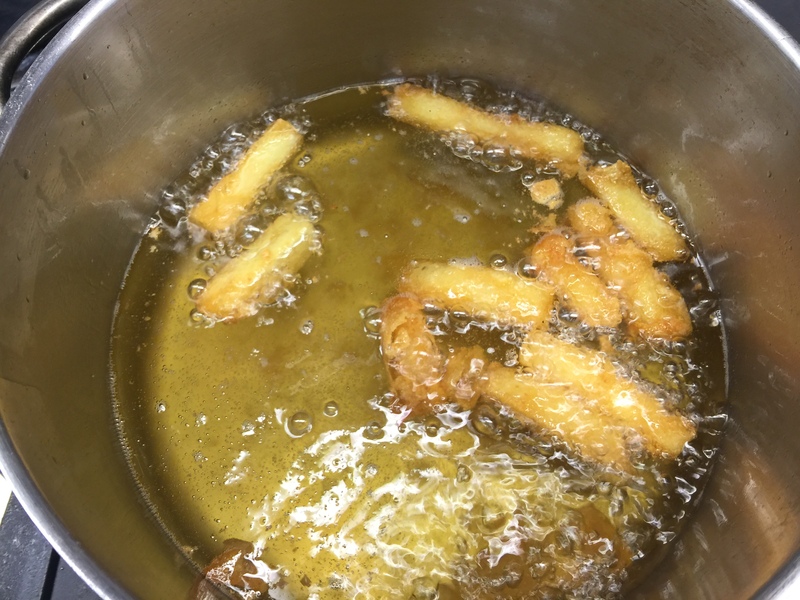 The only thing for us to do is score, season and fry in a hot pan. The cauliflower puree is prepared and set aside and we make a muslin-bag infusion of spices for the vegetables. 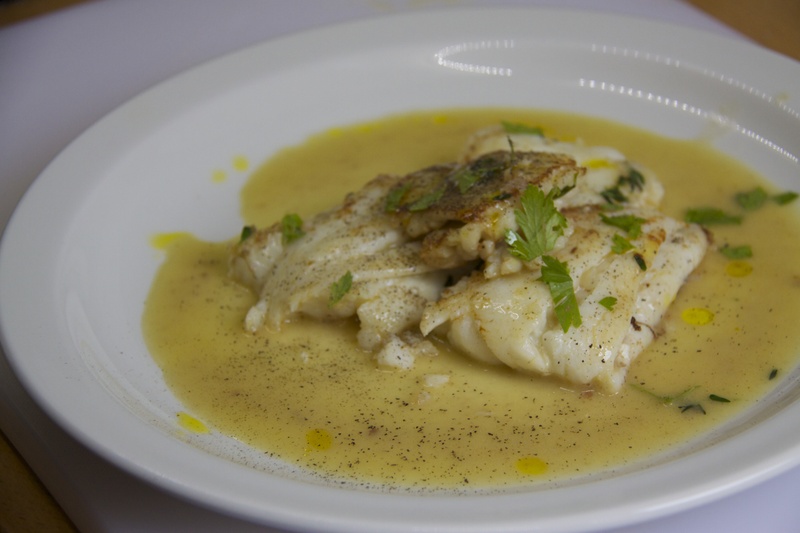 I put my fish into the hot pan, watch the flesh react to the heat, and then let it stick – not the smartest – so I don’t remove a whole fillet of fish. Nevertheless it tastes delicious and doesn’t look too bad on the plate. 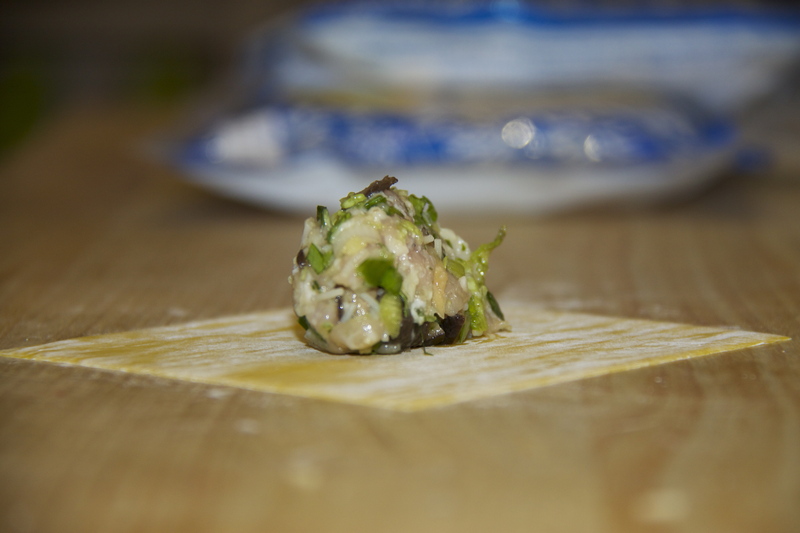 These are lessons you learn in this kitchen so you don’t recreate them at home. Our main course was roast duck on wilted turnip greens with a parsnip tatin. Again all cooked at different times but married at the plating stage. 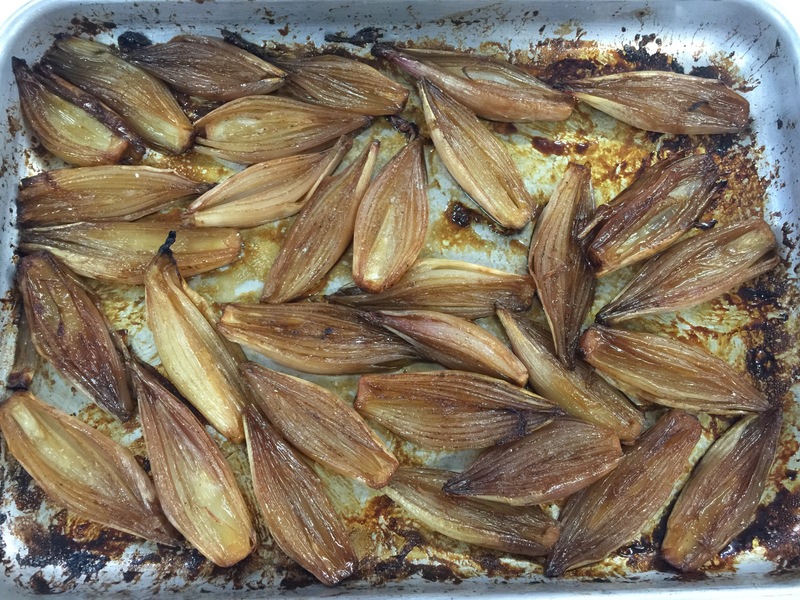 I was particularly delighted with my tatin, I had not attempted an individual savoury tart before and the results were impressive and, more importantly tasty. Usually put off by sauce-making, Monica showed me a technique (sans whisk) that produced a great Port sauce that was rich and buttery and so simple. 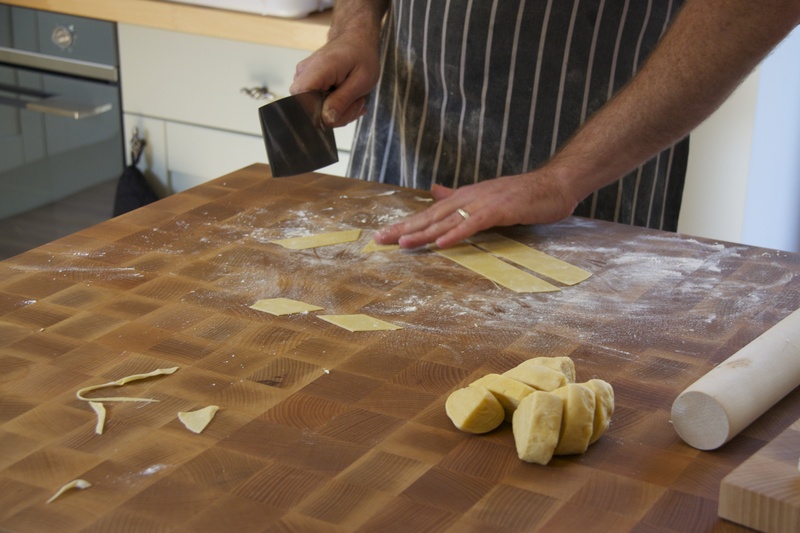 I know that learning new skills and techniques is the point of coming to a cookery school but believe me, I have left lots of classes having just followed a recipe, feeling that I haven’t actually taken any new skills away with me. 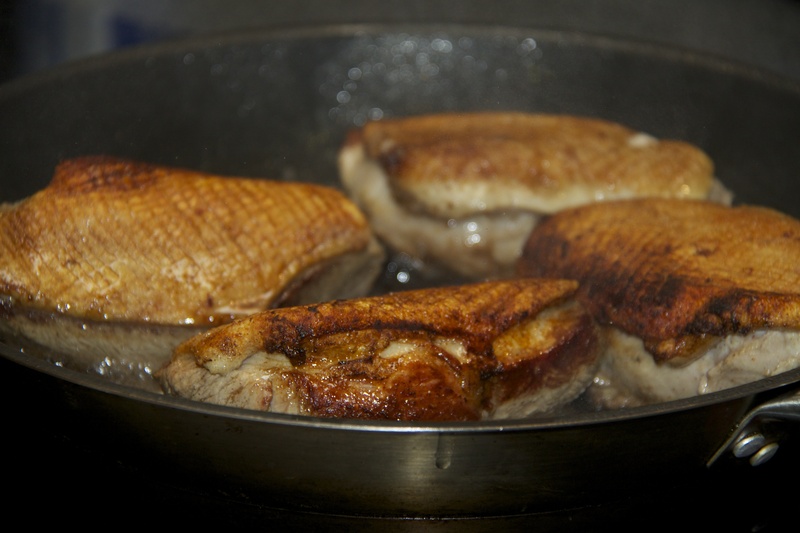 My duck was crispy and cooked perfectly if I say so myself. 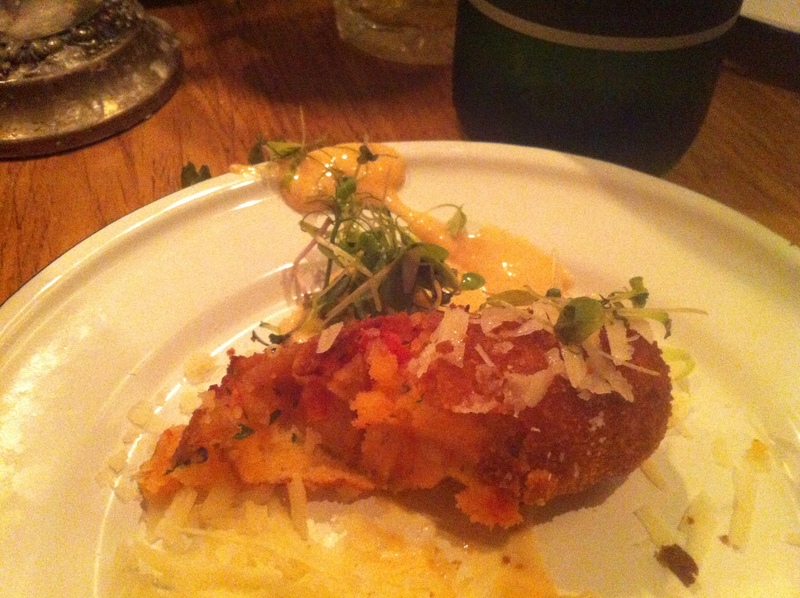 This is mine, not the chef’s finished dish – not bad at all, is it? 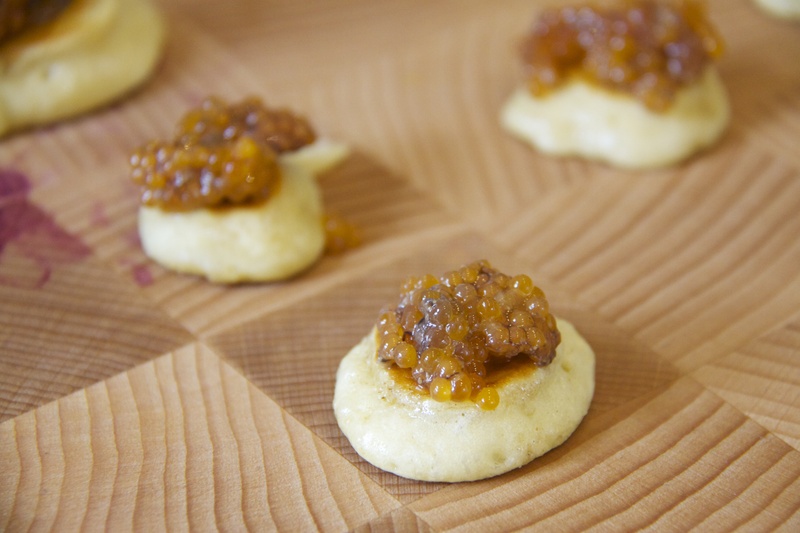 The accompanying butternut squash puree was easy enough to make and brought brightness to the plate. Our dessert was chocolate soufflé with chocolate sauce. Here’s the start of the creme patisserie – the rest I took home and is in the freezer waiting for my next dinner party guests. We eat all the food we prepare on the premises and our last meal is eaten in the dining room downstairs. Michel joins us from Le Gavroche and casts his eye over the finished dishes. He tells us that he’s been sausage tasting for a wedding breakfast, chats about the day, and then signs books which really personalise the experience for some. It’s time then to have a quick tour of the Saturday Kitchen studio (no pictures) and we discover where the show is filmed and where Mr Martin cooks and entertains his guests. 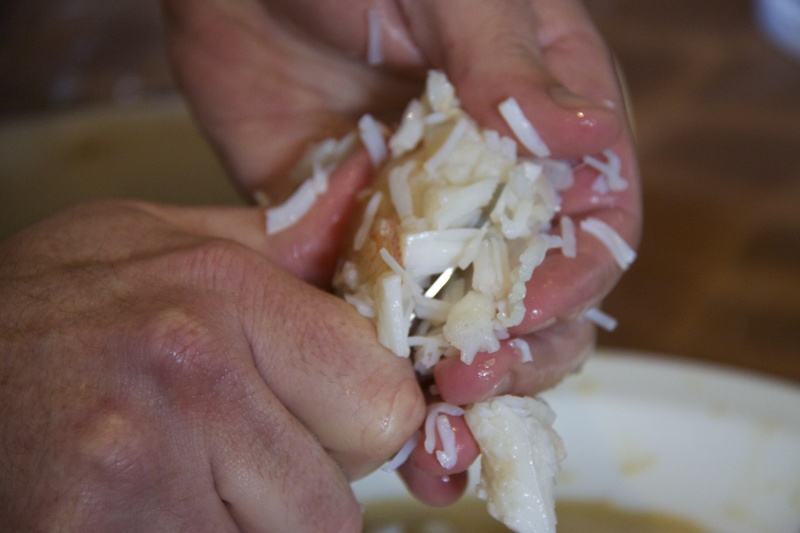 I’ve completed a few cookery courses at home and abroad (Leith’s, Waitrose, L’atelier des chefs, Cookery School at Little Portland Street), but this is nothing like I’ve ever experienced and I picked up a few tricks and tips. Primarily, Monica gave me the confidence to tackle dishes that may not come out well at all. 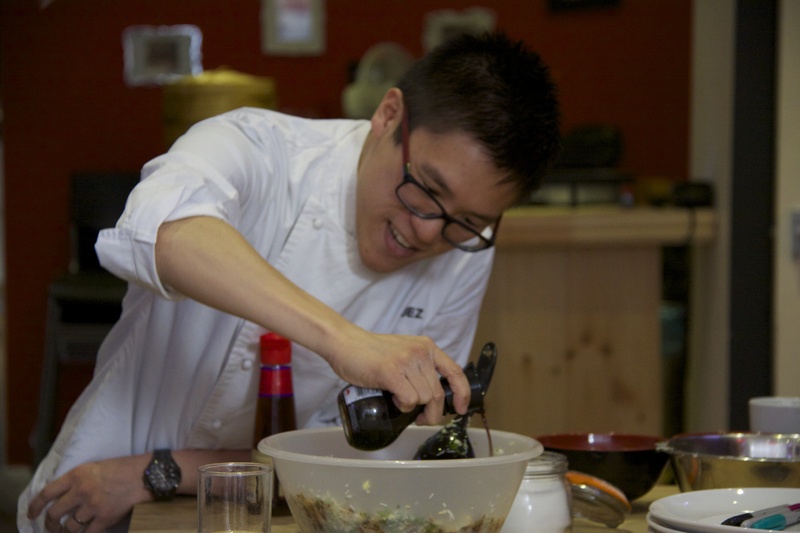 As it happens, I messed up on the relatively simple dish and excelled at the dish that was technically more complex. I was also reminded about the organised kitchen and that plating up is as important as the time and care you take over the dishes – it’s not about how you think it should look, it’s how you want it to look – showcasing your hard work. All common sense I know but when you have a chef showing you how a 2-star Michelin restaurant does it, things seem to fall into place. The whole point of this school is that it’s small which in turn means personal and relaxed. Sure, there are other courses in the UK which are larger, tailor dishes to your skill level but unless I am missing a trick, where else can you spend time in a kitchen with the actual chefs whose name is on the marketing material for this kind of price? 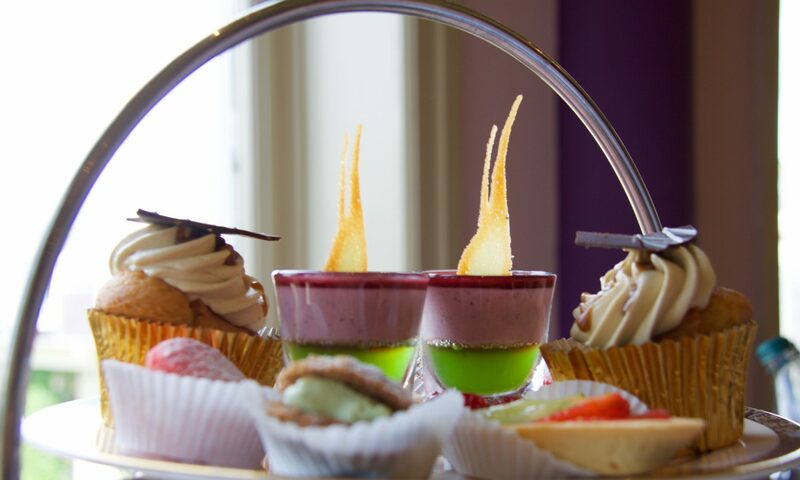 There are a series of cookery experiences from a Saturday Kitchen Cooking Experience (would be rude not to) (£295); a Michel Roux Jr Experience (£595); a Monica Galetti Experience (£595); Michel & Monica Experience (£750); The Ken Hom Chinese New Year Experience (Morning £125 or all day £395); a Valentine’s Wine Experience (£195) and an Adam Byatt experience (veteran of the kitchens of Claridges, The Berkeley and Michelin starred The Square) (£150). 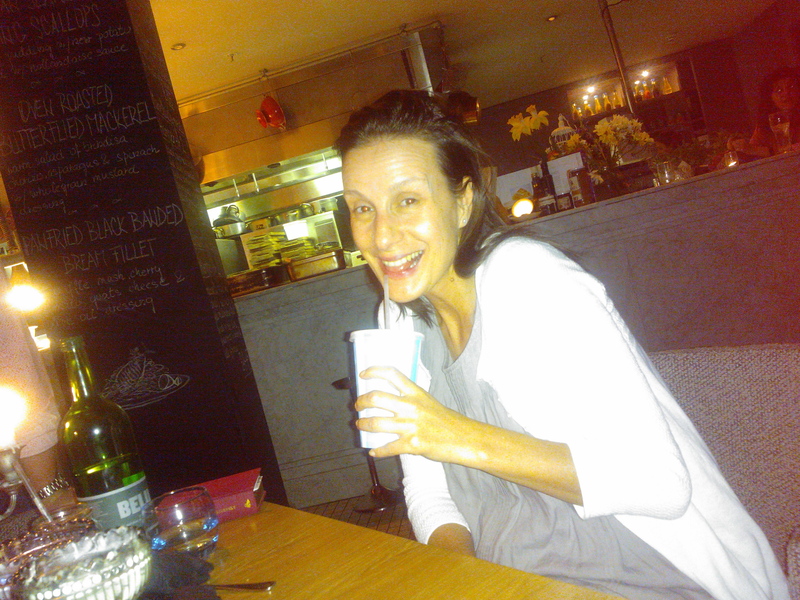 This is the woman who runs Saturday Kitchen and keeps James Martin in check. Her little black book of chefs will be huge and her influence enormous and I can’t wait to sign up for other courses. Would I recommend this experience? Absolutely. 200%. I’m saving up for the next. Don’t hesitate, book it, before the waiting list gets too long. I leave you with a picture that sums up my love for the day – taken, no less, by the charming and totally fabulous Monica Galetti. “These sausage rolls are almost as good as your Mum’s” says the excited voice down the phone, you must blog about this place it’s amazing. I’ve left them one of your cards. “This place” was Rosalind’s Kitchen and the enthusiastic call was from Mr. Coincidentally, I had just discovered Rosalind’s Kitchen a few days before, although I’m sad to say it’s been open for a year and I’ve been working around the corner for two. Rosalind’s is take-away only, and whilst Little Portland Street isn’t a main pedestrian route, it runs parallel with Upper Regent Street and Great Titchfield Street and both of those streets are off Oxford Street so it’s incredibly easy to find. One of my colleagues from the newsroom, Alice B drew me to it after she told me about ‘Milk Tea and Pearl’ which is next door (see separate blog). And sure enough not only has she good a good nose for news, she’s got excellent taste buds because Rosalind’s food is really delicious. Not the cheapest compared with the slew of high street chains we have on offer, but you really do get what you pay for and it’s a welcome alternative. 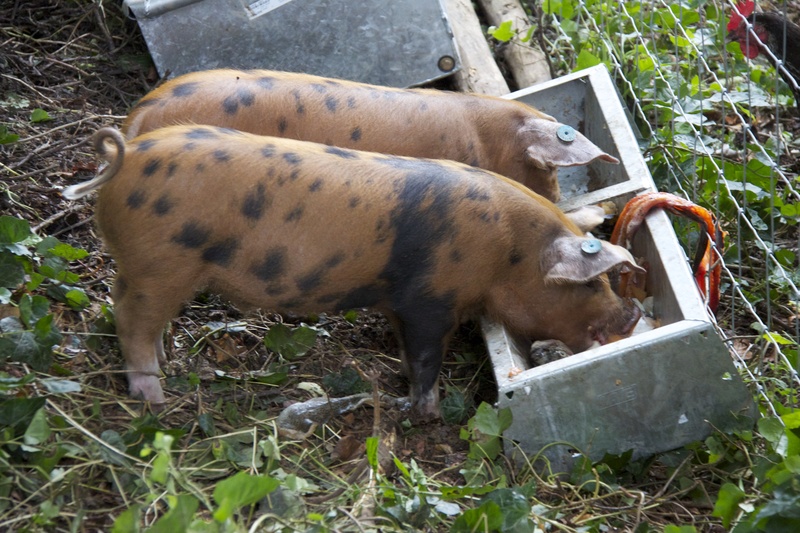 All their meat is from Sheepdrove Organic Farm, fish from Southbank, they use Yeo Valley organic milk, Coombe Farm cheese and they get their olive oil and chorizo from Brindisa. The flour used in their sublime all-butter pastry is milled at Shipton and their coffee is made by Has Bean, using ‘original’ beans. I don’t think I have tasted a better savoury tart (sautéed mushroom, caramelised onion & herb) or sausage roll in a very long time but then that’s all to do with how fresh the product is. 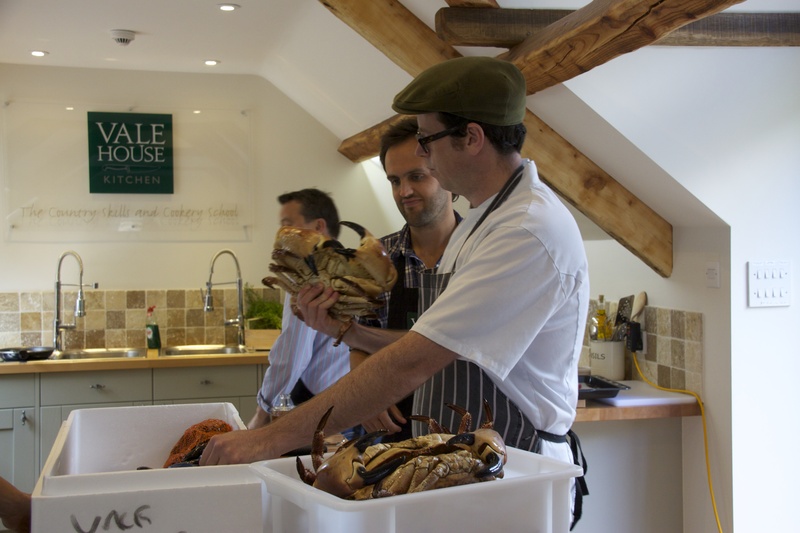 Made in the kitchens of the Cookery School, which Rosalind Rathouse also runs, (and by the way is her full-time love and passion), the food is literally walked across the road to the shop. Mixed slaws, and a variety of salads from chunky potato and herb, winter tabbouleh, roasted vegetables, mixed rice, green lentil and mushroom and what has become my favourite the market, are just some of the salads on display each day. There’s also a soup of the day, which changes each day. Breakfast service includes home-made granola, Bircher muesli, homemade fruit compote and spiced buns. The morning I had yoghurt the compote was pear, apples and quince without a single grain of sugar in it, naturally sweet. A generous helping of granola contained cranberry, pumpkin seeds and fig and a great start to any wintry day . Rosalind has been championing sustainability for years, well before “celebrity chefs” made it trendy to mention the ‘S’ word. 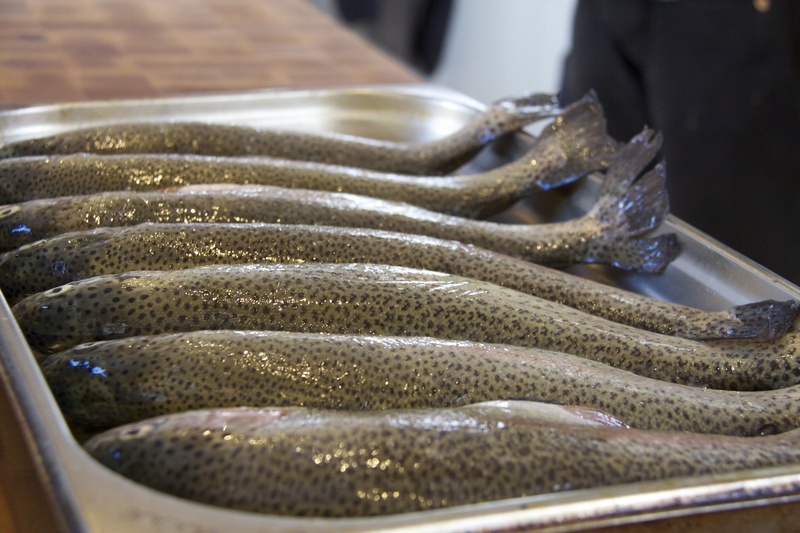 It’s always been part of the Cookery School’s ethos before the likes of the Sustainable Restaurant Association and Sustainable Fish City were born, although she’s a member of both. All the fish used is sustainably sourced, they focus on saving energy, have reduced their water consumption, and as the Christmas season rapidly approaches, be rest assured they’re steaming their puddings under the turkey – keeping the bird moist and saving on fuel. They’re also meticulous about recycling. All deliveries are made in metal or glass containers, and use recycled foil. If there’s food left over at Rosalind’s the local offices luck out so she’s also doing her bit for the love food, hate waste campaign. And, their kitchen food waste is composted and none of it ends up in landfill. She even hosts an annual fundraiser for Action Against Hunger and throughout the year donates to local London and national charities. So what of this Cookery School? Well Rosalind is also the brains behind that and she’s totally obsessed with food. She’s worked as a professional cook, run her own cookery business and taught cookery to both adults and children for years. In her kitchens she grapples with the fears of the least confident cook by teaching in plain simple language. She runs individual or group classes and there are courses in seasonal vegetables, fish, rare breed meat, how to cook with leftovers and cooking for the pot. Ingredient laden benches for a corporate cookery class were being laid out when I arrive and Rosalind also offers evening classes that start at 19:00. What a perfect end to the day, leaving for home with a new skill and a freshly baked loaf, cake or pie and by the way a brilliant gift for the hard-to-buy-for. Oh, and once last thing. If you’ve not had time to make your own Christmas cake, Rosalind’s selling a weighty 1.4kg cake for £25.00. 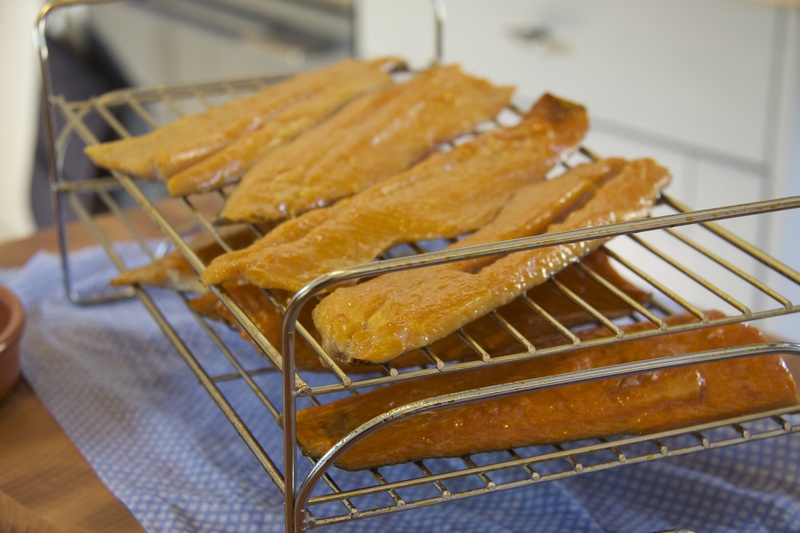 It’s made with all-organic ingredients including ground almonds, fruit, eggs, Shipton Mill flour, sugar and brandy. Not for the under-age or tee-totallers in your life she’s been soaking glacé cherries in alcohol for the past few months. And, if it’s anything like the cupcakes, I’m only sorry I’ve made mine. Open Monday to Friday 0730 to 1600.